Trips not taken by RV. 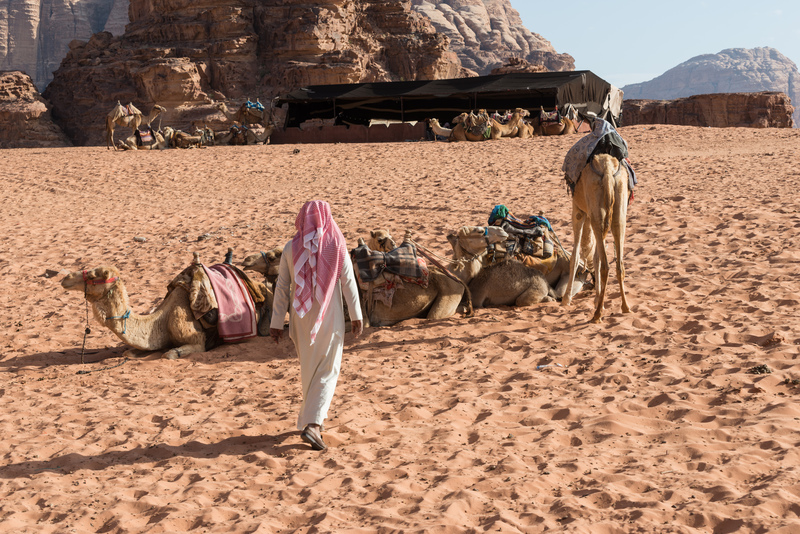 Everyone goes to Wadi Rum to see the desert. 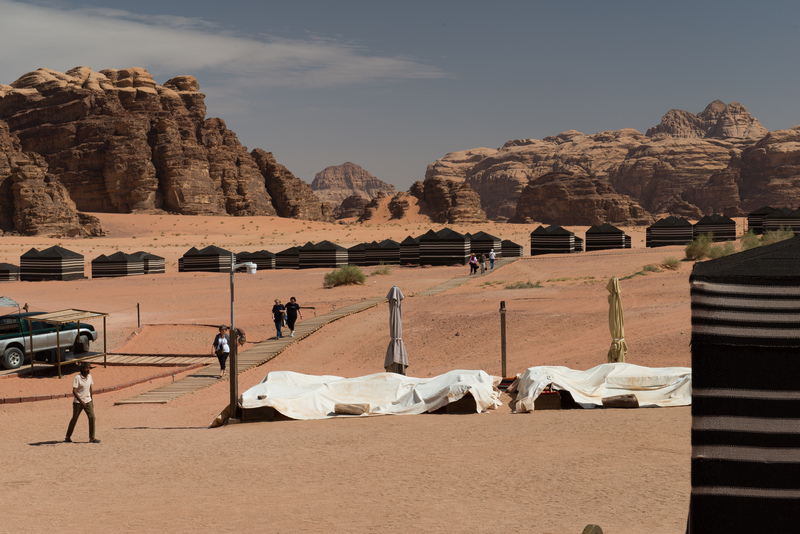 But, in fact, the Bedu have stayed at Wadi Rum over the years because there is so much water. You won’t see it immediately, but once your eye gets trained, the signs of water are everywhere. 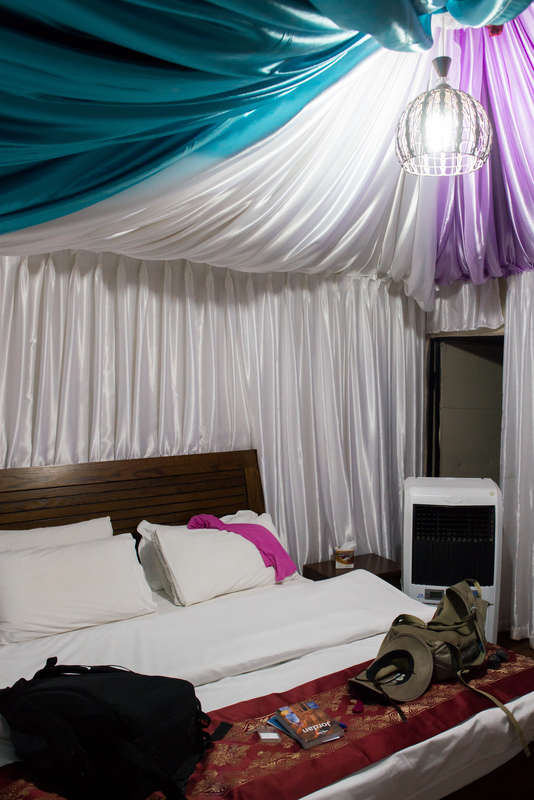 We stayed in a luxury Bedouin camp (or tented hotel) novel and quite comfortable. We arrived rather early and found the place deserted. Probably should have made a stop en route but we were a little short on information at that point. A little more Arabic would have been useful at times! However, once we sorted out what was happening, we crashed a party of Italian tourists and enjoyed a great buffet lunch of salads with chicken and rice. 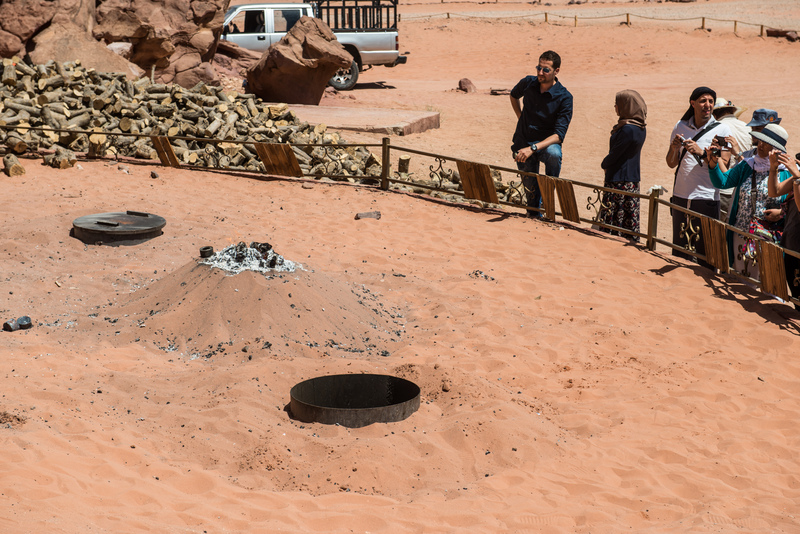 The meal was cooked traditionally – buried in the sand with a wood fire on top. This, of course, made for great photo ops. The meal was further enhanced by a dancing waiter! 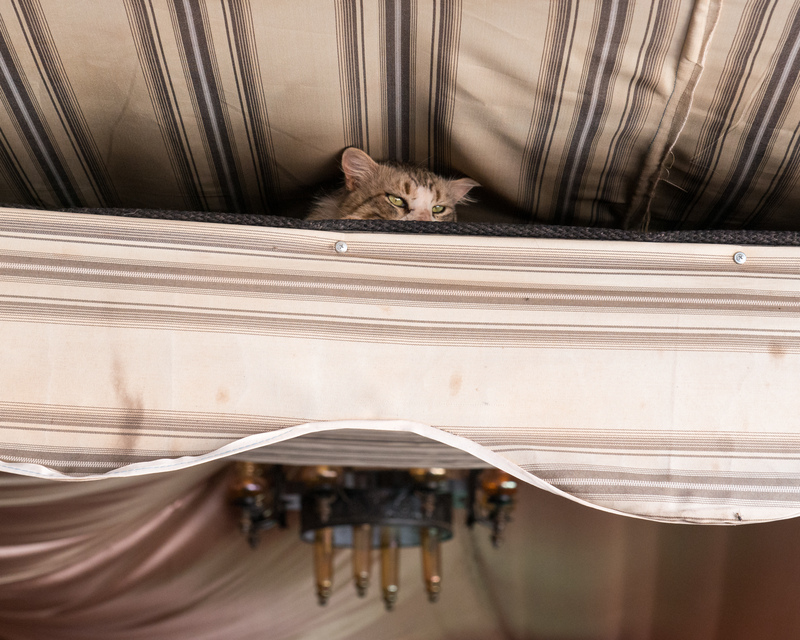 We then relaxed for the early part of the afternoon in the shaded divan with the desert coolers running. 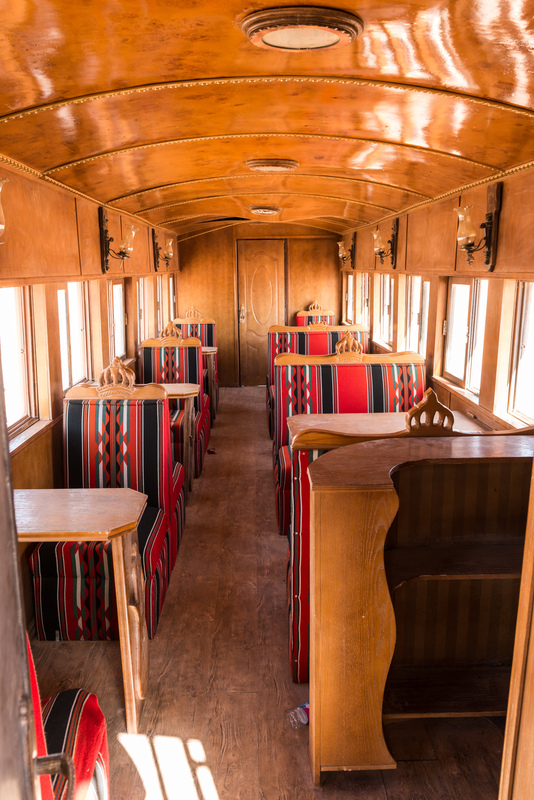 As the temperature began to cool, our driver arrived to take us on a tour of the desert. We made ourselves comfortable in the back of the pickup truck and headed out to our first stop; the site of the filming for the “base camp” in the movie “The Martian”. Our guide had been present at some of the filming so was very enthusiastic about it all. 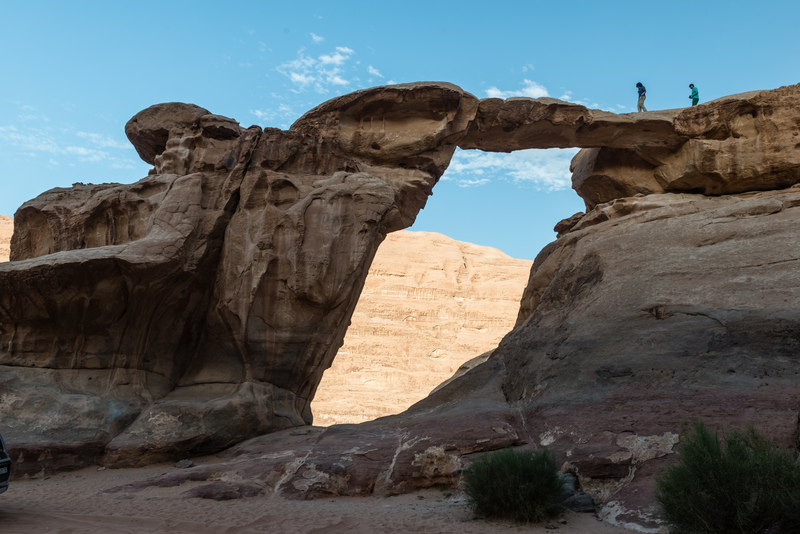 We also saw several sites relating to Lawrence of Arabia (the person, not the movie) along with scenic sites like a natural rock bridge. The only spot for cell phone reception! 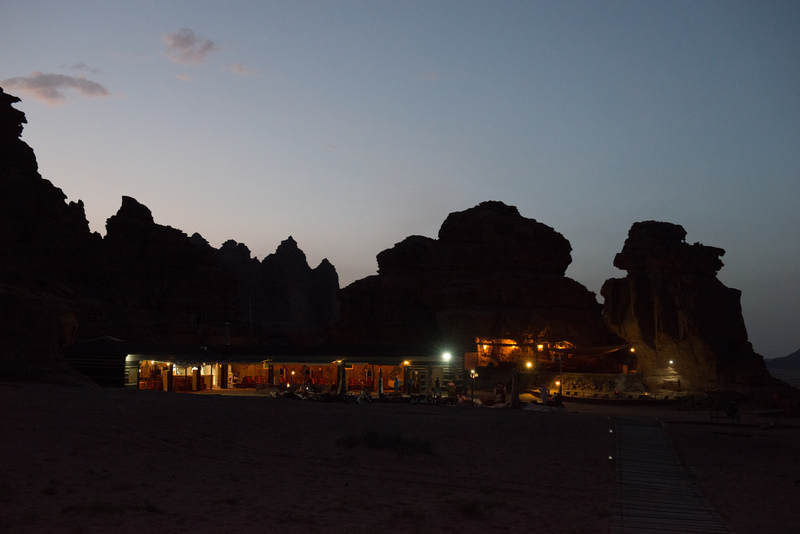 Our guide stopped just before sundown and made us tea in the desert before our return to the camp just after sunset. 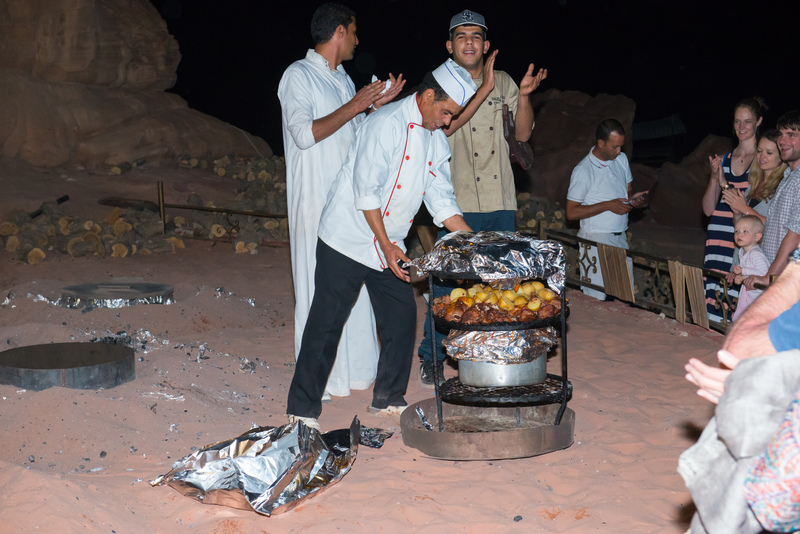 Dinner was a traditional meal called sarb, cooked in a fire pit in the ground. We were served an excellent chicken and mutton with assorted vegetables and pilafs. The temperature was starting to drop so we headed back to our tent for the night. The room decor was a bit over the top! 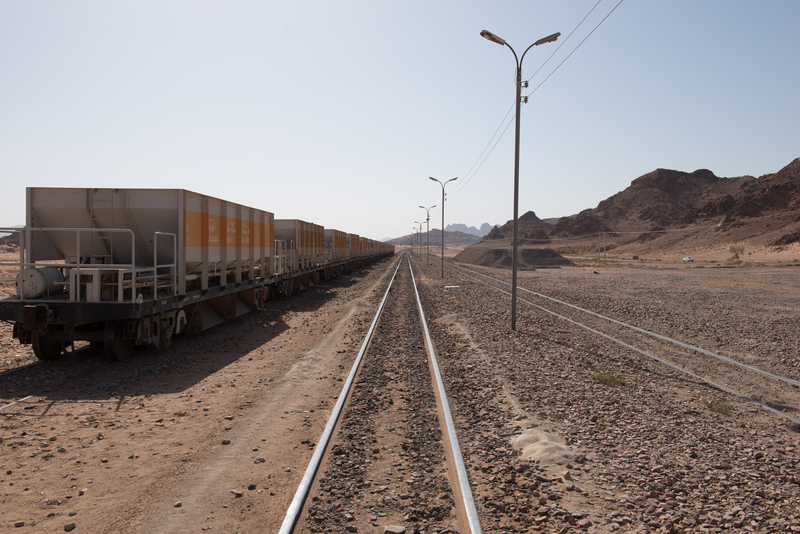 A modern train still runs, carrying potash, we saw it several times as the camp is close to the main line. No, Lawrence didn’t miss this one, it is actually a Japanese engine from the 1950’s. The modern potash trains are less picturesque, if more valuable. And on to Aqaba where we hope the Queen Elizabeth awaits us! Our driver had arranged access to the port and he left us right beside the ship. Other than the fact that we were trying to go up the gangway while thousands of passengers were coming down, it was the easiest ship boarding we have ever had. We were greeted by the Purser’s office and escorted on board to our cabin. We had hoped to visit Aqaba a little before boarding but we seized the moment and a nearly empty ship to do laundry and settle in. As we waited to sail, we watched the Europa II depart. This entry was posted in Other Travel on August 24, 2016 by DiploStrat. 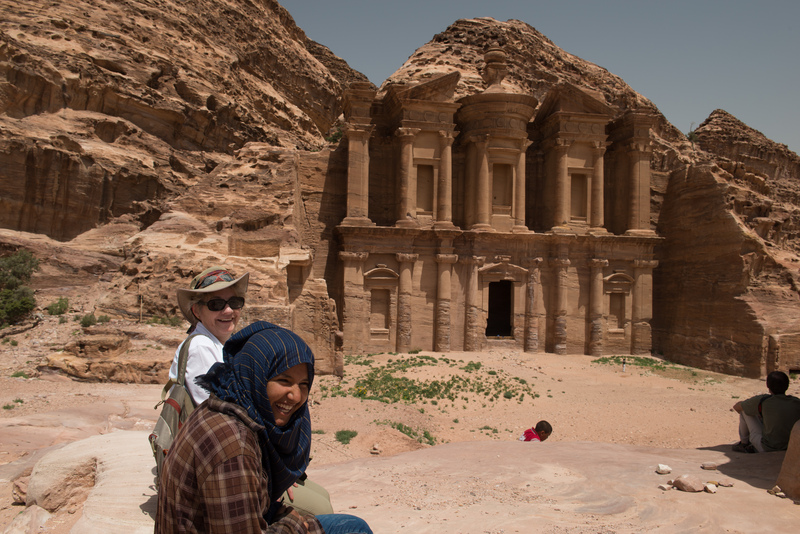 Our second full day at Petra was one of the highlights of the trip. 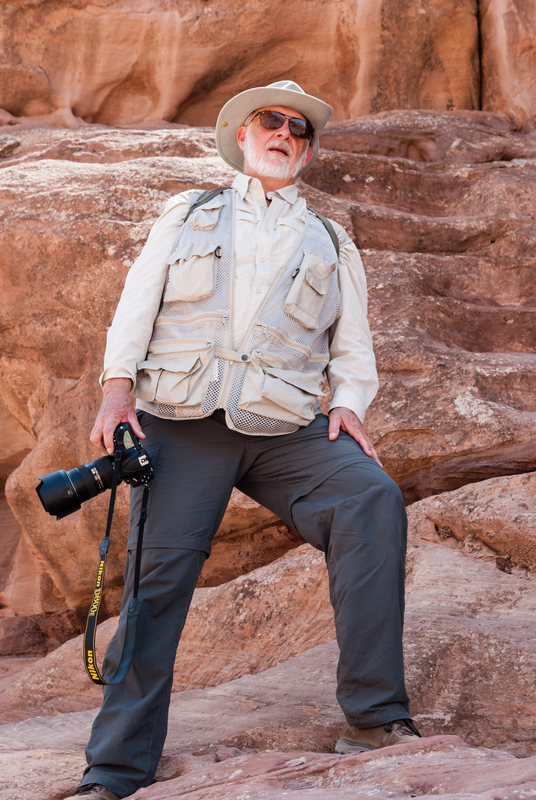 Fred had been impressed by several photos taken of the Treasury from above and he had heard rumors that there was actually an easy route to get to the vantage point. 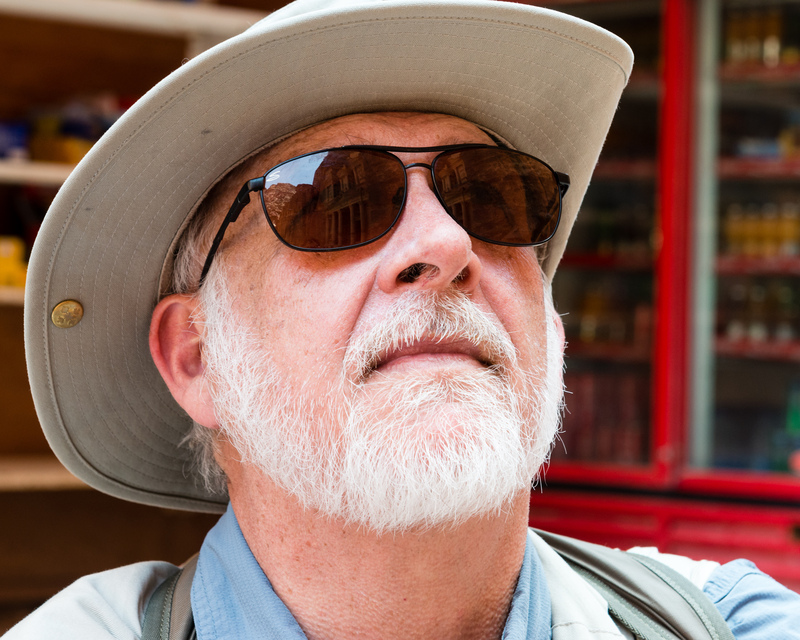 The challenge was to find a guide who knew the way. A visit to the guide office found Achmed, who would guide us. He recommended taking horses to make the climb easier for Denise and although Fred was very unsure about this, we agreed. It proved to be a wise and most enjoyable choice. Achmed discussed horses just inside the gate and procured three excellent ones, complete with their owners, and we set off. The horses ambled at an easy walk, except for when the track was too dangerous for them to carry anyone and then we dismounted and walked beside them. At this point we pause for a quick aside. 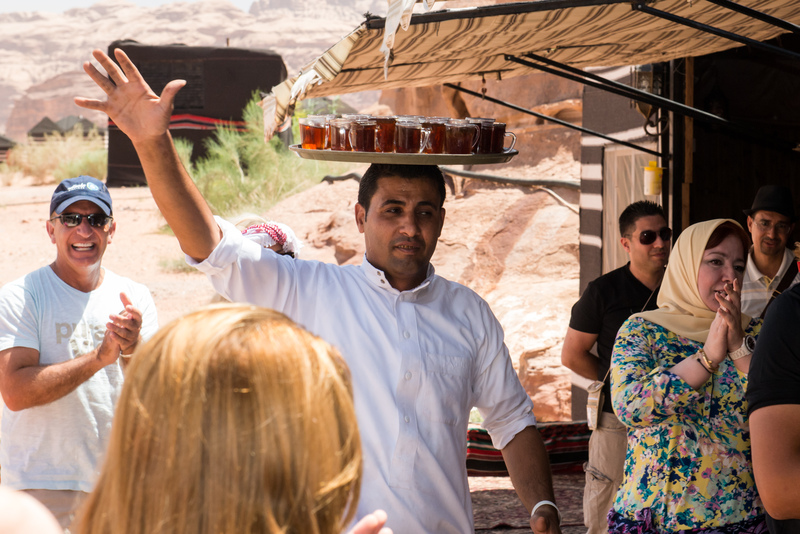 Tourists today enter Petra through the narrow and spectacular Siq, but the site is, of course more easily accessible from the north and south as the city actually sits in a broad valley. And, of course, any invading army could easily climb over the mountains. 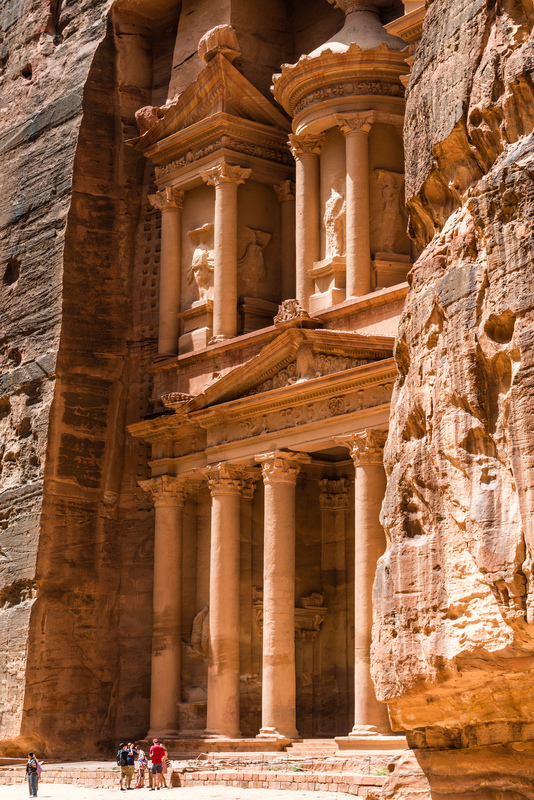 So why is Petra where it is? Water. 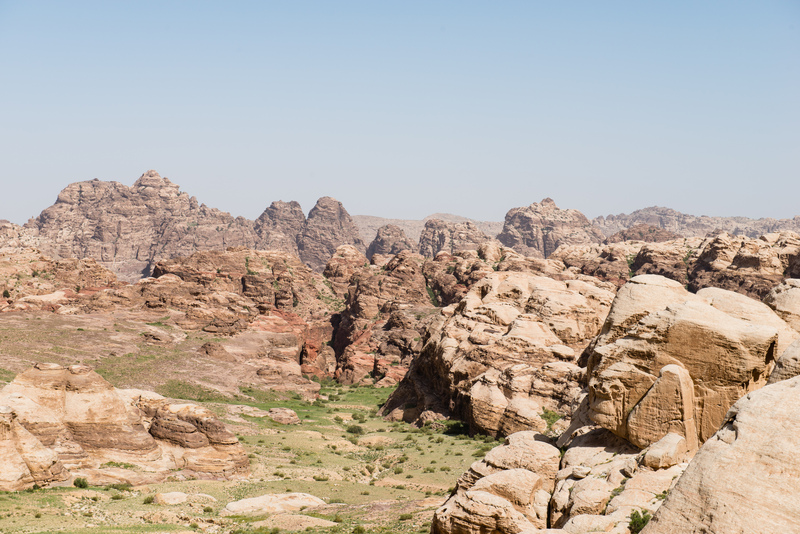 The mountains around Petra actually get a fair amount of rain and the Nabateans were experts at channelling that water into the city where it was stored in cisterns. 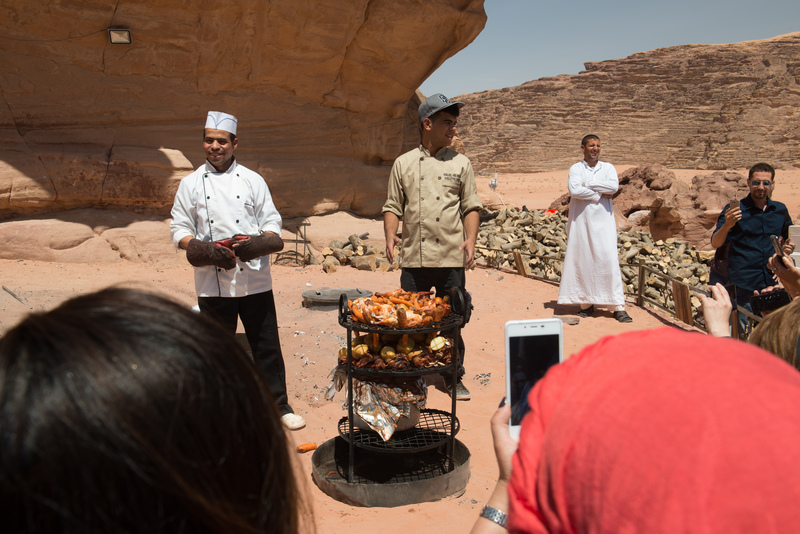 And, while it is not immediately obvious from the tourist route, Petra is surrounded by large, flat plateaus which are perfect for agriculture. 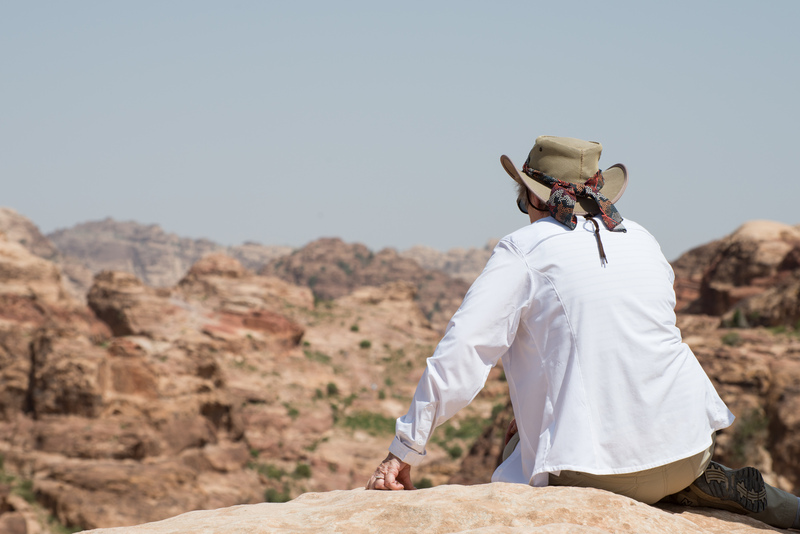 It was quite fascinating to be up above the Petra Valley on the flat agricultural lands. The Crusaders destroyed the olive groves and they have never been replanted. 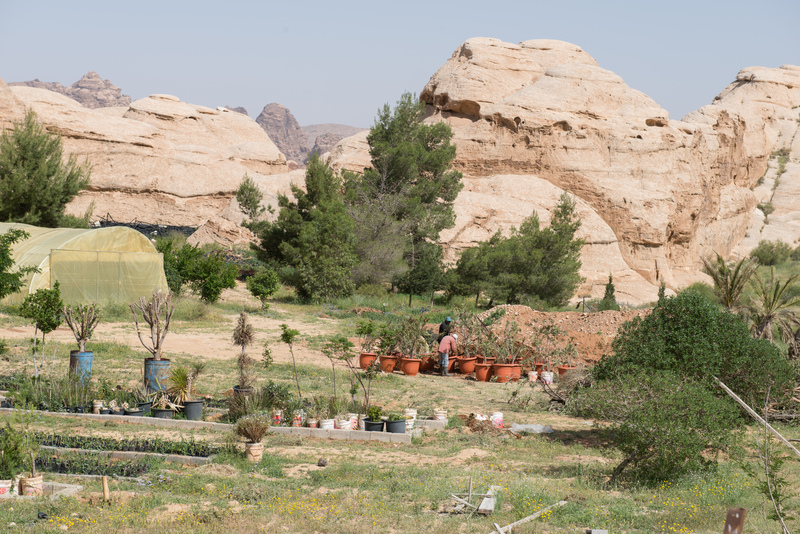 A project is currently attempting to recreate and reestablish the Nabatean water control methods with a view to irrigating for agricultural purposes. 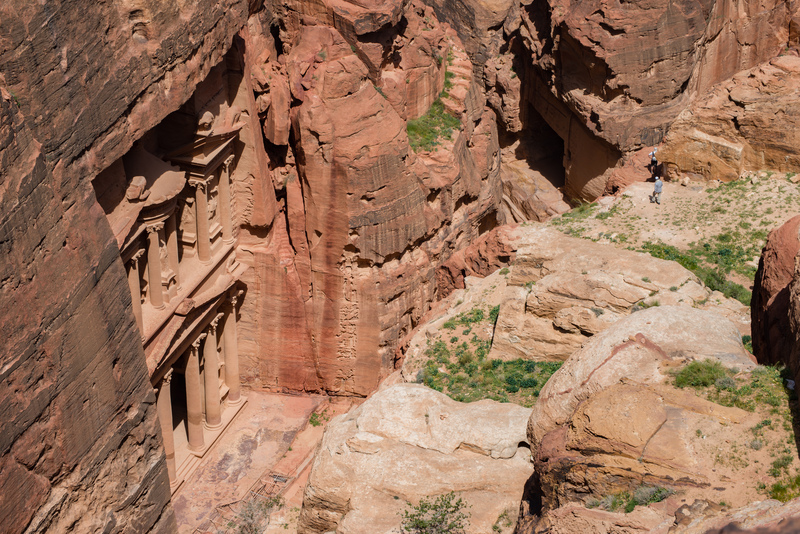 The Nabateans grew grapes and olives and traded wine and olive oil from the Petra valley. We had quite a scramble to get to the viewpoint above the Treasury but it was worth it. And then, when you climb down, you come to this: Notice the people on the left, they have come up one of the steeper climbs. If you zoom in and look directly in front of the facade, you can see the underground rooms that have been unearthed. Denise paused to take in the view. Back on the horses and off to the Place of High Sacrifice. After more riding, walking, and scrambling, we came upon the site from behind. 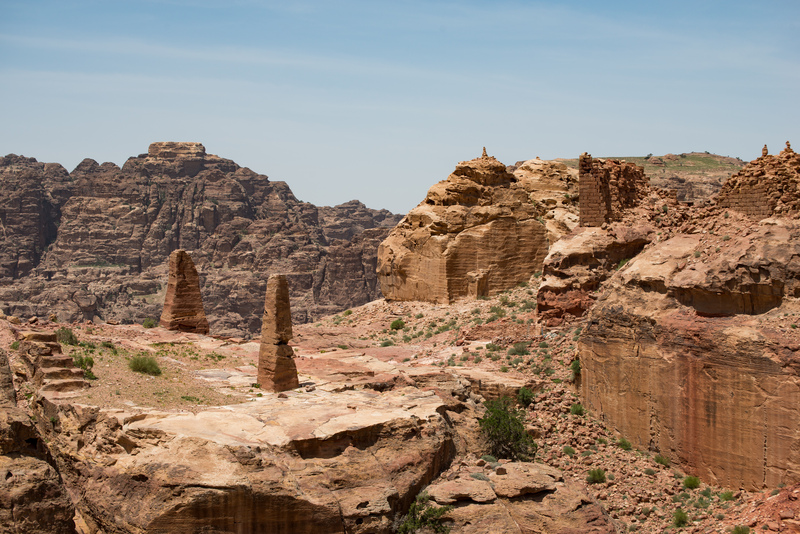 The Nabateans weren’t adverse to digging and carving – notice that the two pylons are carved out of the mountain, not erected. 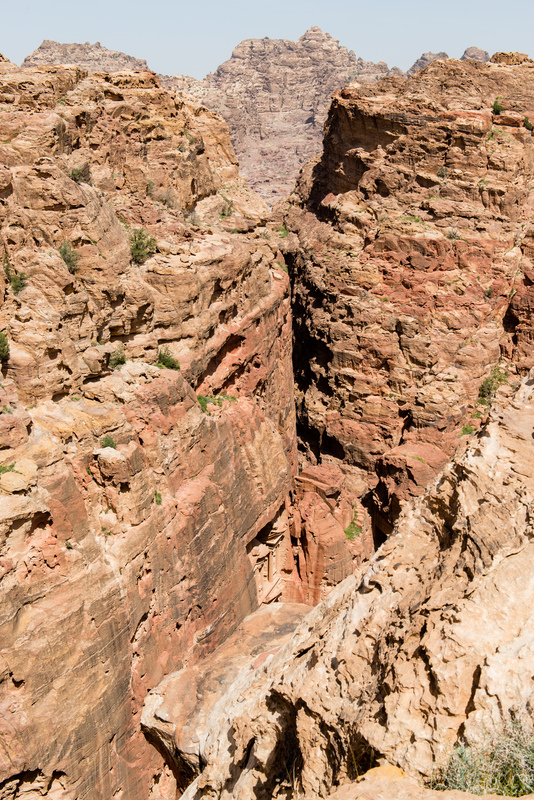 Can you imagine the work it took to smooth the cliff faces on the right of the image? Back in the day, it looked like this. 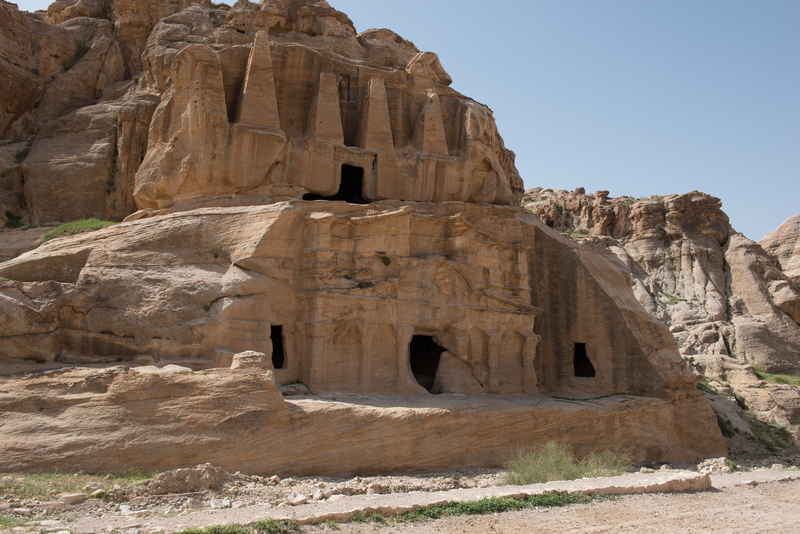 The point of a high place is to build an altar and the Nabateans did some beautiful stone work with channels to carry liquid. We can simply imagine what liquid. From the stone work still remaining, it is likely that much of the site had walls at one time. Not sure I want to know what ran through these courses. Ancient cistern, still in use. Note the pump. We wandered and took photos before beginning the descent of the steps. It was certainly an easier descent than it would have been to climb up. Fred was never able to find the section of stairs that had scared him so as a child. The main street, just after the Treasury. Back in the valley, we admired the theatre. 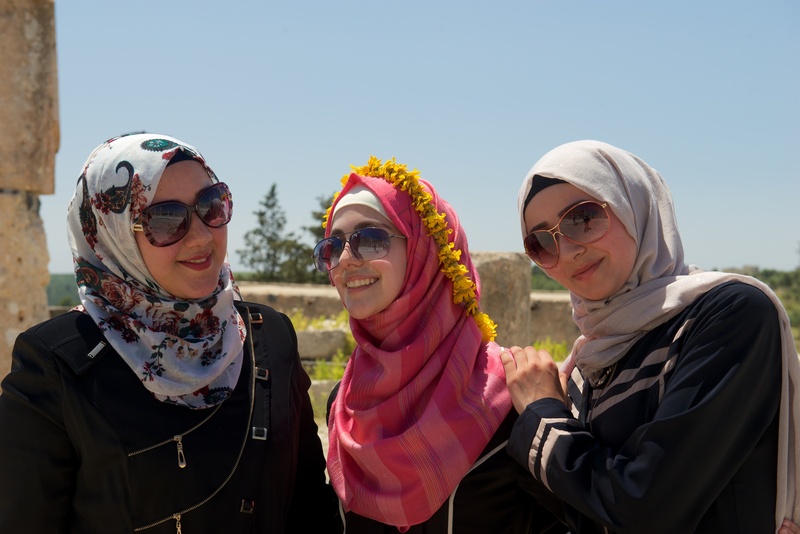 By this time, after Amman, Um Qais, and Jerash, we were about theatered out! We made our way back to the Treasury to hit the refreshment stands and to indulge in a bit of people watching. Our guide to the High Places. Girl talk, and water, at the Treasury. Achmed composed and took a great shot of the Treasury in Fred’s glasses. 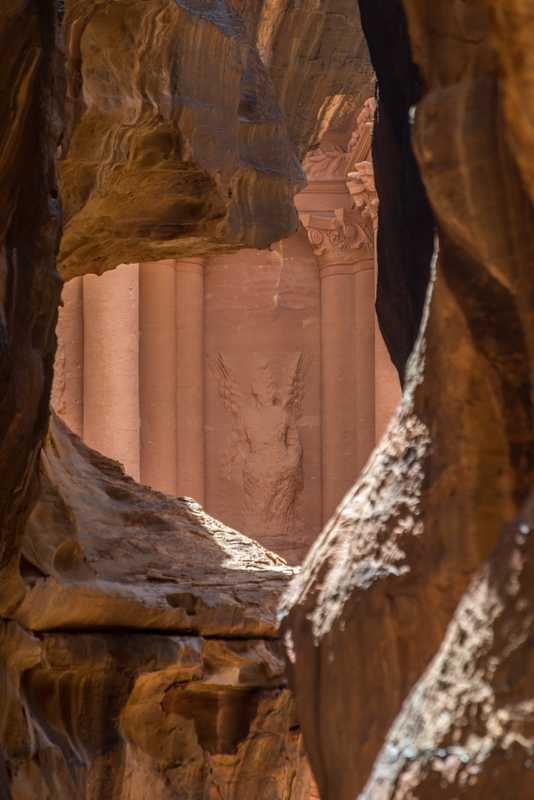 Fred took one last stab at a slightly different take on the classic Treasury-through-the-Siq shot. 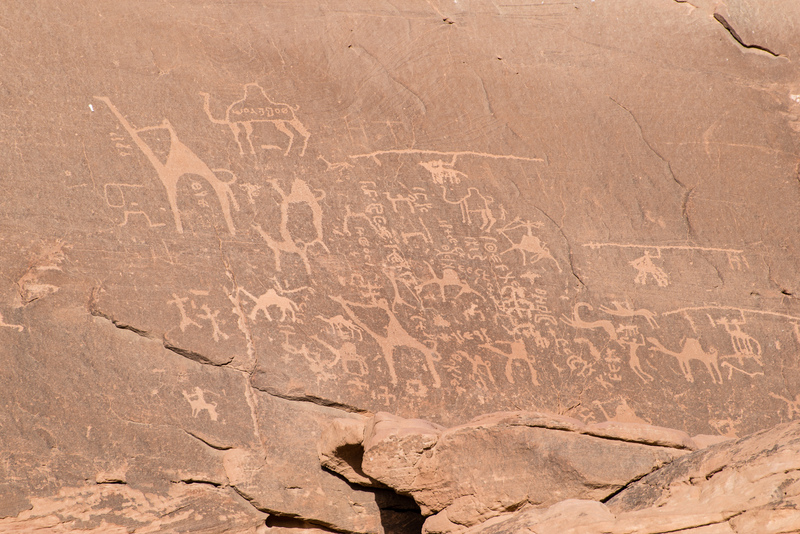 We hiked, OK, trudged, our way back up through the Siq, stopping to admire what had been a fabulous carving of a camel caravan. Complete with a person leading. Sadly, the soft sandstone has washed away, but you can see that the water course actually ran behind the camels’ legs. The eroded image of the camel caravan. We were back to our hotel by about 4.00 pm. Again after a shower and a rest, we headed to the buffet for dinner. Afterwards, we stopped to chat to a gentleman putting sand in bottles in various patterns and designs. Fred remembered these from his childhood and he was happy to purchase a couple. Sadly, he had closed up by the time Fred went back for his camera. And what could Denise see? The top of the Monastery. Amazing! 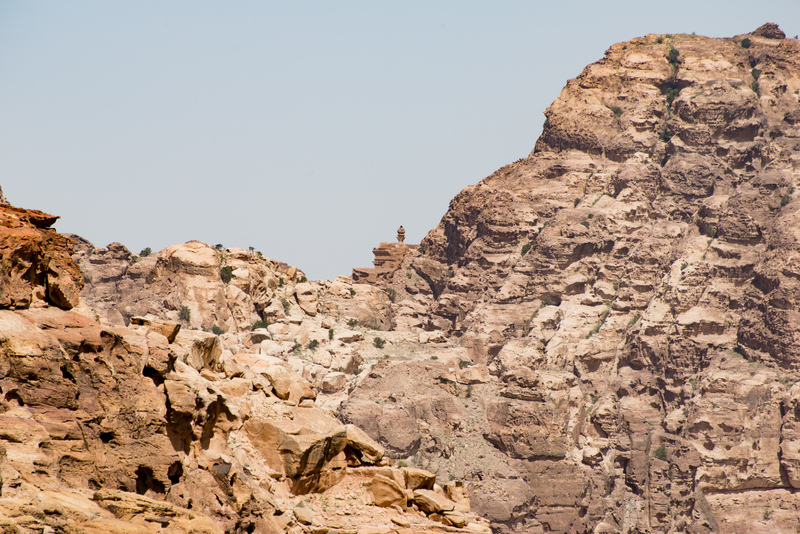 Actually, if you know where to look, you can see it from several of the higher points around Petra. This entry was posted in Other Travel, Uncategorized on August 14, 2016 by DiploStrat. 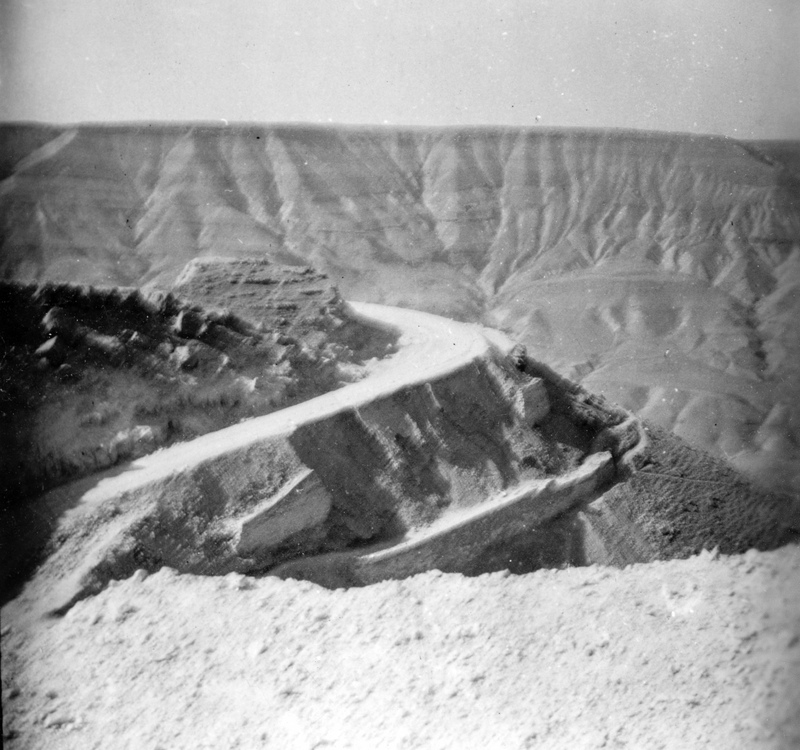 The old highway to Petra. This translates to a lot of grinding in low range! 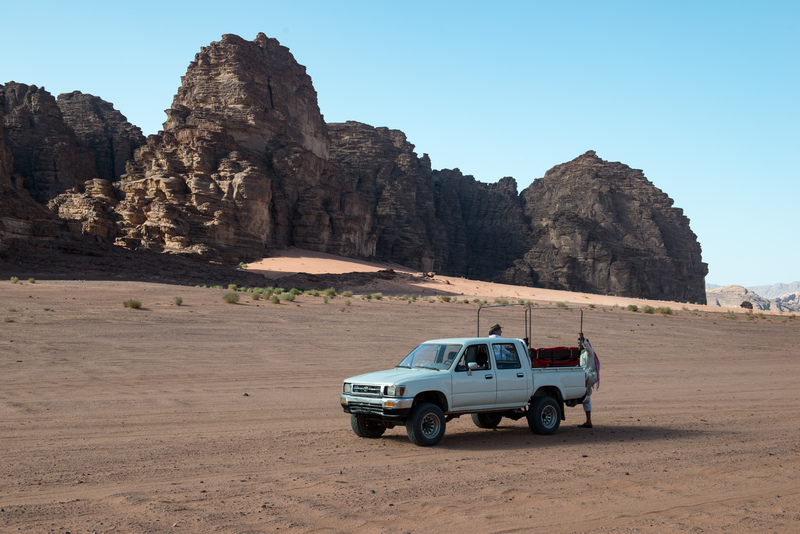 4×4 geeks may be interested to know that the trip was made with a Land Rover and a Jeep Station Wagon. Today there are excellent paved roads, complete with travel centers. 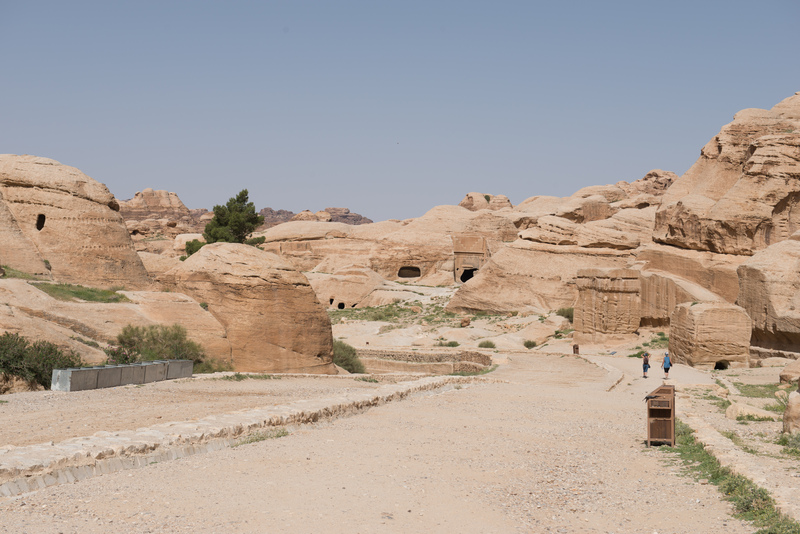 We had booked a room at the Movenpick Hotel, which is right at the gate to the Petra ruins, which proved to be an excellent idea. The hotel was lovely and we checked in thinking that we had picked well. Beautiful lamp in the hotel lobby. 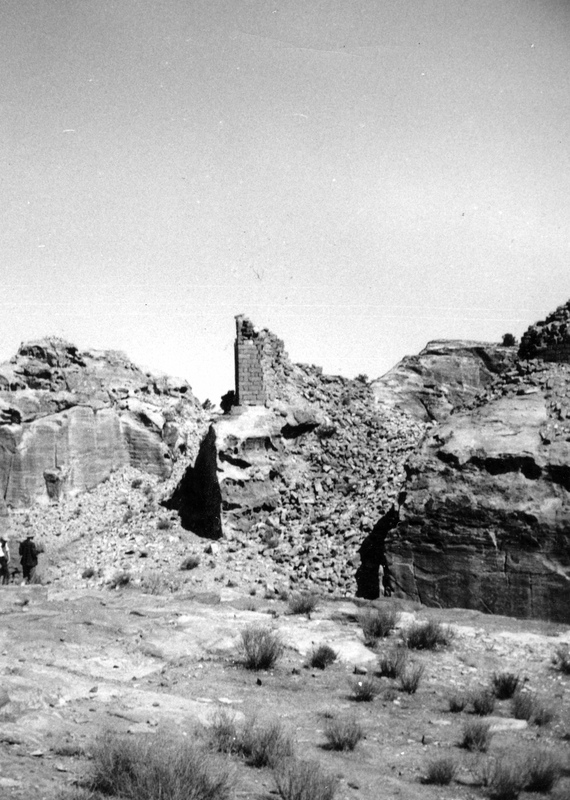 As a point of reference, back in the ’50’s one stayed in the ruins themselves, either in caves or tents. 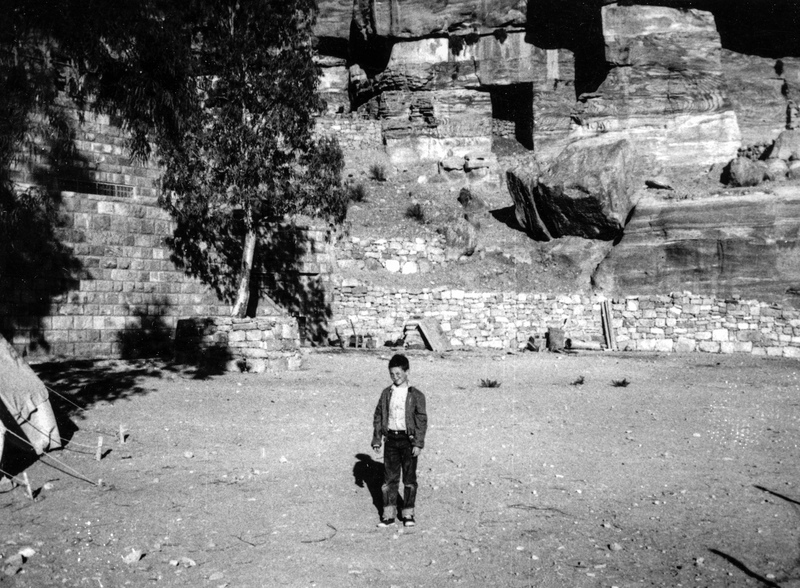 Fred at Petra in 1957 or 58. Visitors stayed in tents (on left) or in the caves at the back of the picture. The accommodations were a bit more Spartan, but as we discovered, you were a LOT closer to what you wanted to see. We then went off to look for soap powder and drinking water as hotels provide a small bottle per person in each room but it was hot and dry and we were in need of water to both drink and carry with us on our adventures. We had success and returned to our room to wash some of our dirty clothes and hang them on the line over the bathtub to dry. 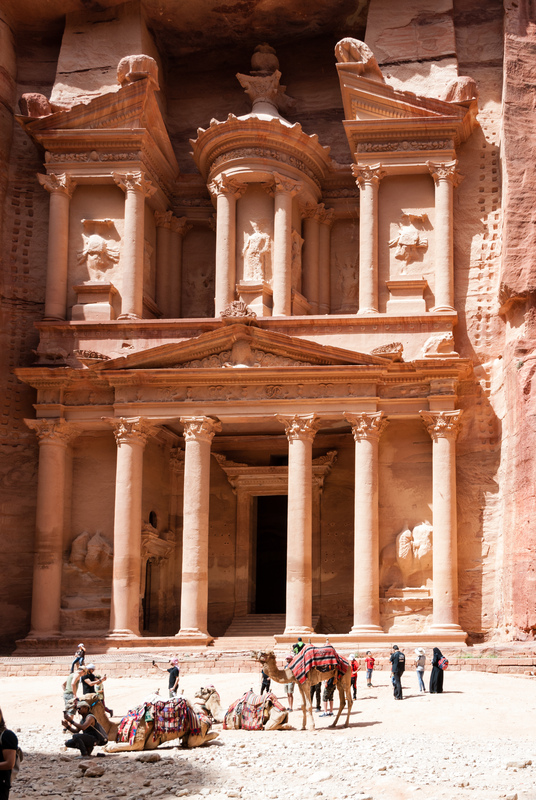 Then we wandered over to the main ticket office for the Petra ruins for a general reconnaissance as we had been told it was necessary to show a passport and we wanted to check this. 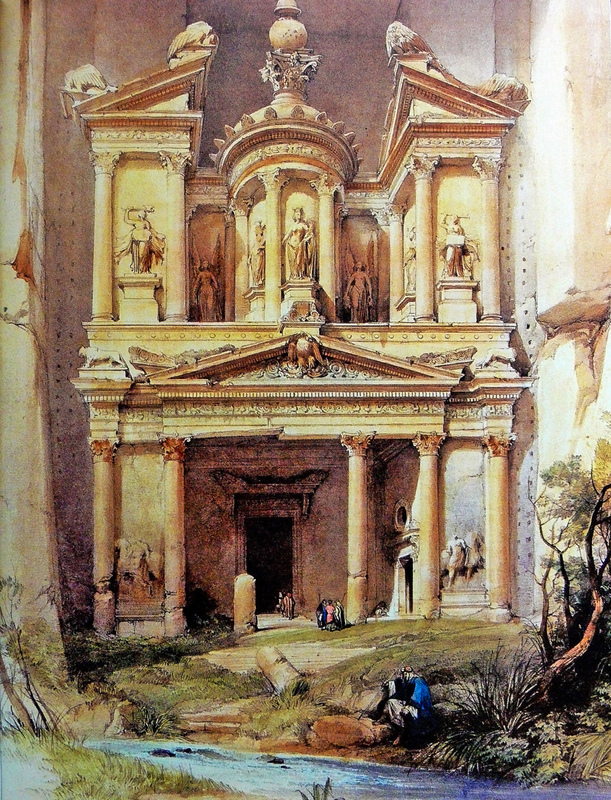 We had considered signing up for a “Petra by Night” visit but had not been sure. 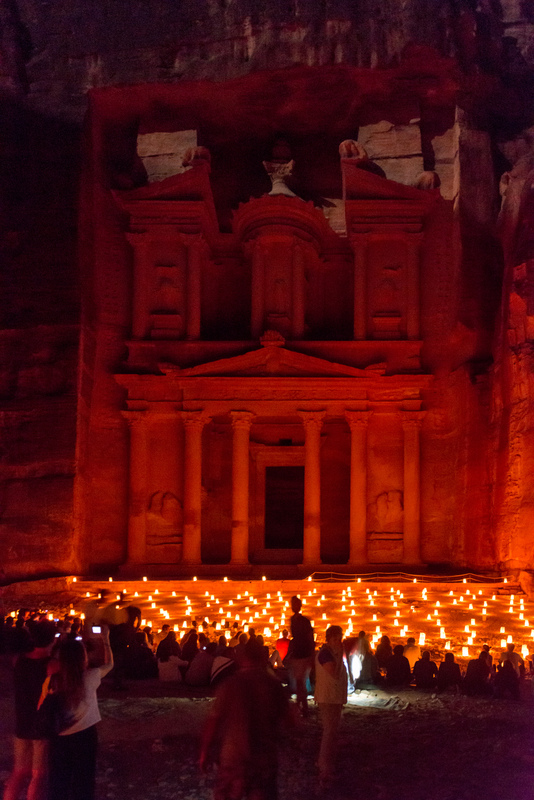 However, we discovered that we had only one chance to see Petra at night and that was the same evening. So we signed up quickly and headed back to the hotel for an early dinner at the evening buffet. This proved to be amazingly good, especially the excellent Jordanian dish that we both enjoyed. They even had lots of vegetables! 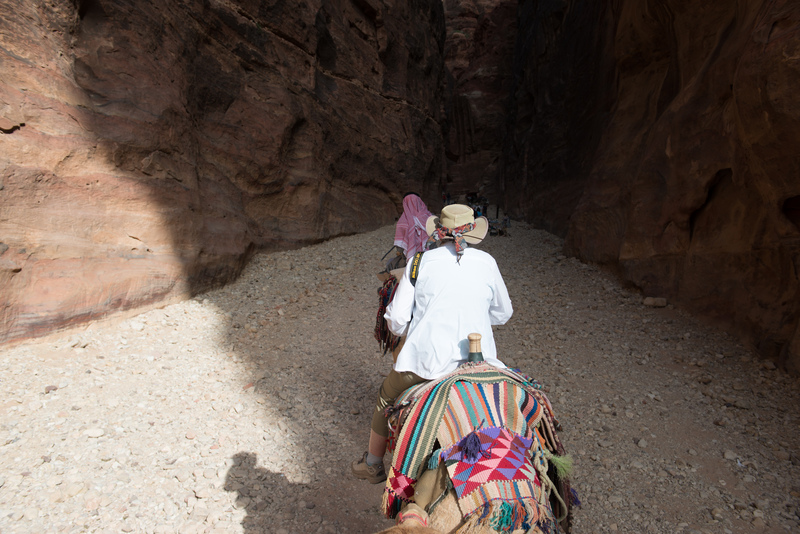 We were back in the courtyard by 7.30 pm to head off towards our first glimpse of Petra. And what a glimpse! 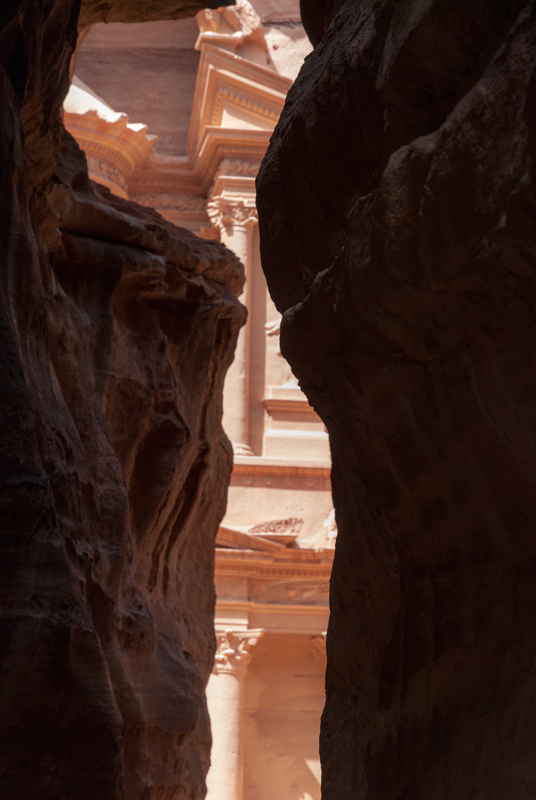 The Treasury is a 40 minute walk from the entrance, through a more open section and then through the famous Siq, a 1.2 Km canyon and the way was lit by candles which gave a romantic atmosphere but made it hard to see the way over the rough stones. But we made it in one piece, ankles intact, and we took our place on the mats and watched the different color lights playing on the front of the Treasury. Treasury by moon and candle light. One local performer played a flute and another played a rehbab. A bit touristic, perhaps, but both were very evocative. At the end of the performance, we walked back to our hotel. 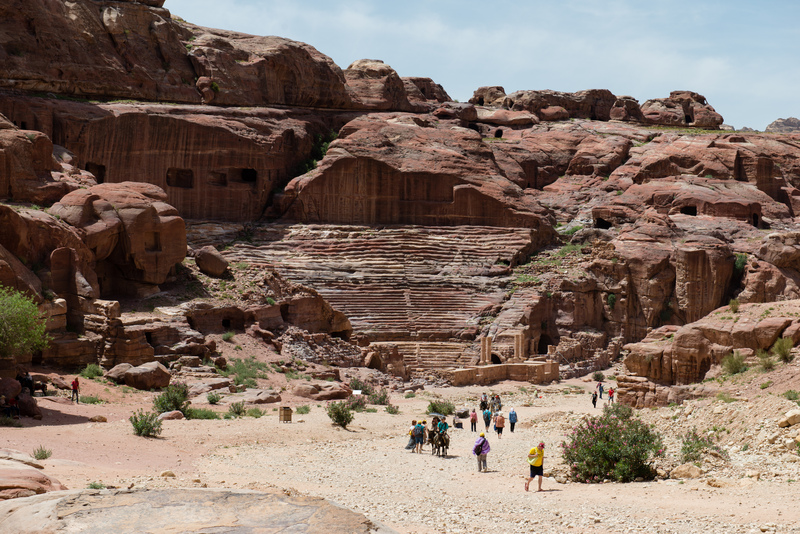 We decided that our goal for the first full day at Petra was the Monastery (El Deir), a fairly steep climb. So, we bought our tickets at about 8.30 am and headed off to the ruins. 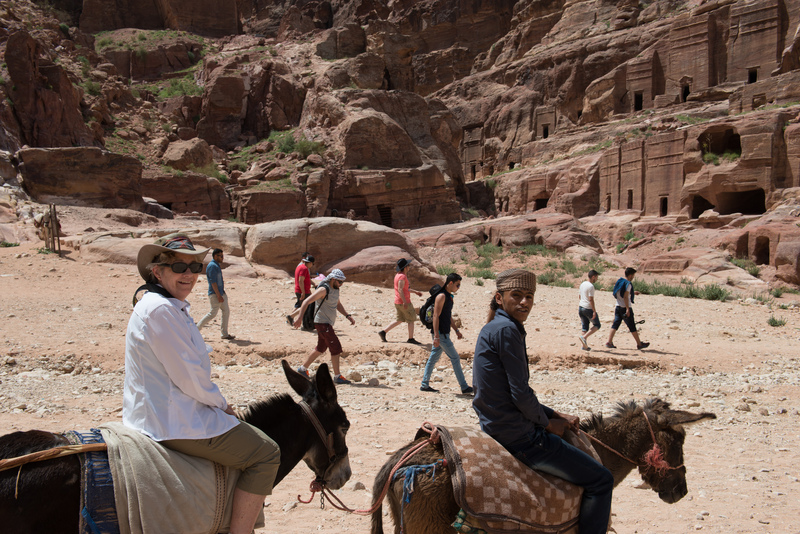 The first part was an easy stroll down the hill from the down of Wadi Musa (Valley of Moses), where the hotels are located, to the city of Petra itself. All of our rambles start at our hotel, next to the visitor center on the right of the map and then continue down through the Siq. The map is not to scale, but as you can see, it is a (long) hike to get anywhere! 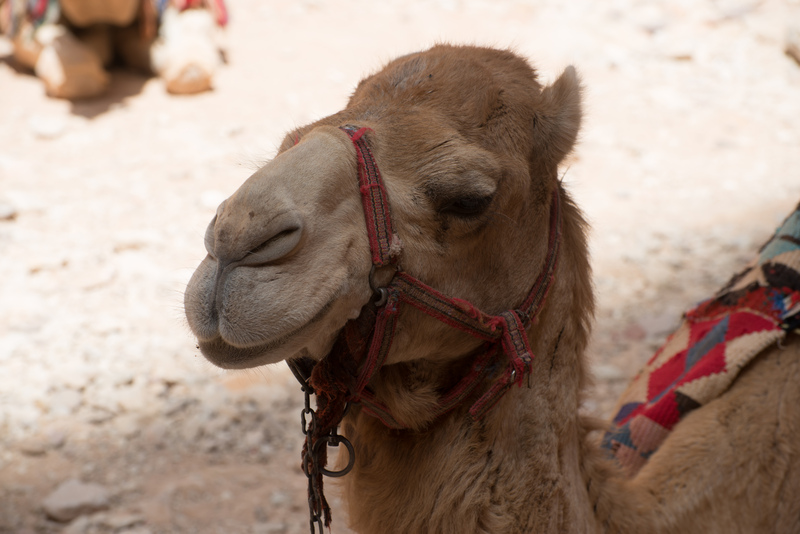 This leads to a thriving business of carriage, donkey, horse, and camel rides. It was interesting to see the early part of the walk, which had been invisible the night before, and where there were three monuments known as the Djinn (A djinn is a spirit, the origin of the word “genie.”) blocks as well as the Obelisk tomb. We then came to the mouth of the Siq. There had been an arch here. The arch has since collapsed. The Treasury through the Siq. A classic shot. Fred was fascinated by the changes that had occurred since he had last visited. 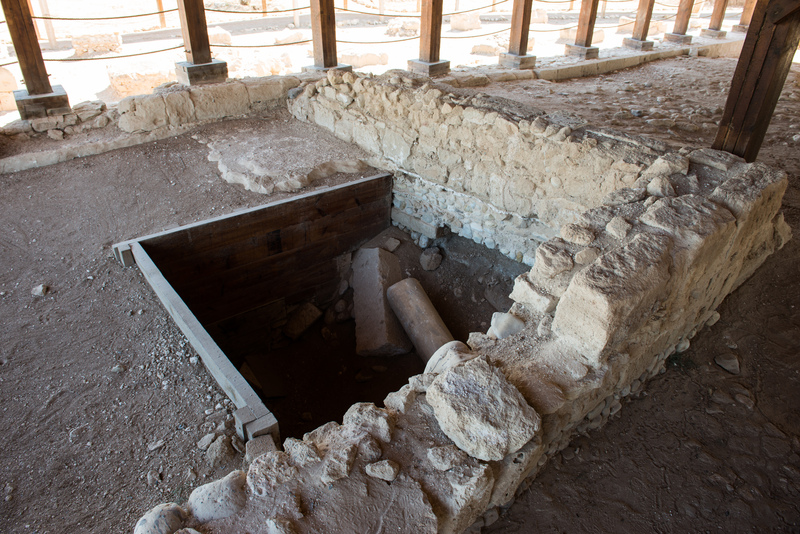 — The space in front of the Treasury has been excavated. The broken column is clearly shown. Note the river and the level of the ground. At least twenty feet of dirt and spoil has been excavated and they have found rooms in front of the facade. Two views of the center of the facade. My camera gear and skills have improved a bit over the years. The Urn atop the Treasury. 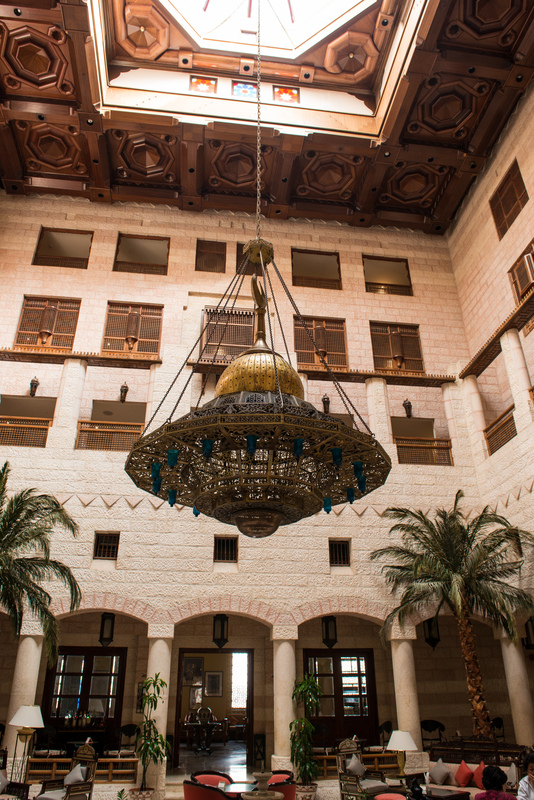 The Bedu used to shoot at it as legend had it that it contained the treasure of the Pharaoh. Picture Fred took of the Treasury, complete with light leakage. If you look very closely, you will note that the third pillar on the left is missing. It was re-erected sometime after the 1950’s. Another shot of the Treasury. Many complain of the crowds, but, in reality, the people watching was fun. And the steady flow of tourists certainly helps the local economy. 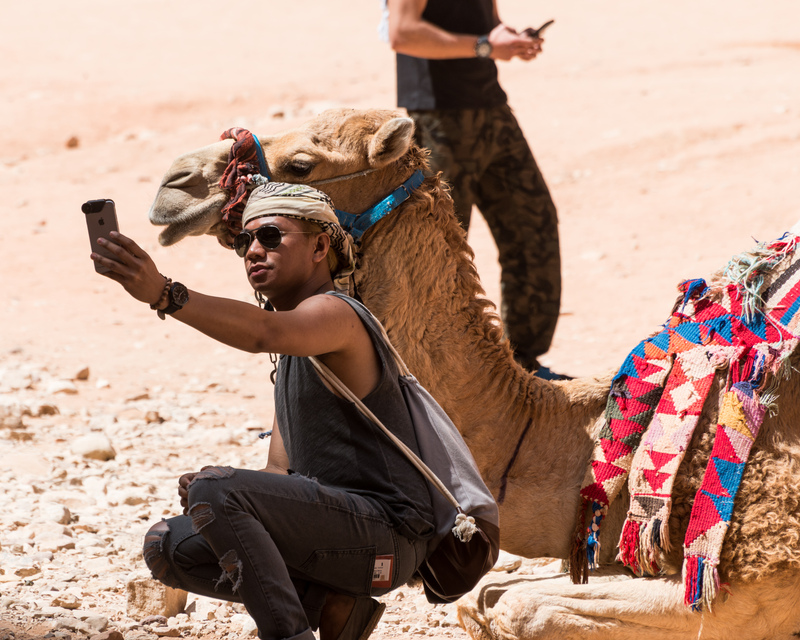 Everyone wants a selfie with their camel. We then made our way down the main street or Street of Facades towards the steps for the Monastery. Denise decided to take a donkey part of the way, though Fred climbed the entire distance. Denise was impressed. Fred, just as tired as he looks! The climb is long, but offers amazing views back down the valley. The main city center is down there on the valley floor with a wall of tombs in the background. Flowstone of the side of a mountain. Flowstone is usually found in caves. Towards the top we stopped for a lemon with mint from a really pleasant vendor with a lovely shady divan where we could rest for a while. It was very hot and sunny and we carried two bottles of water but were consuming them fast. And then, we turned the corner. Your first view of the Monastery as the trail comes around the corner. Comparing the two images, the realism and accuracy of some of these old images is simply amazing. As always, expand the images for more detail. We paused for photos and to admire the wildlife. 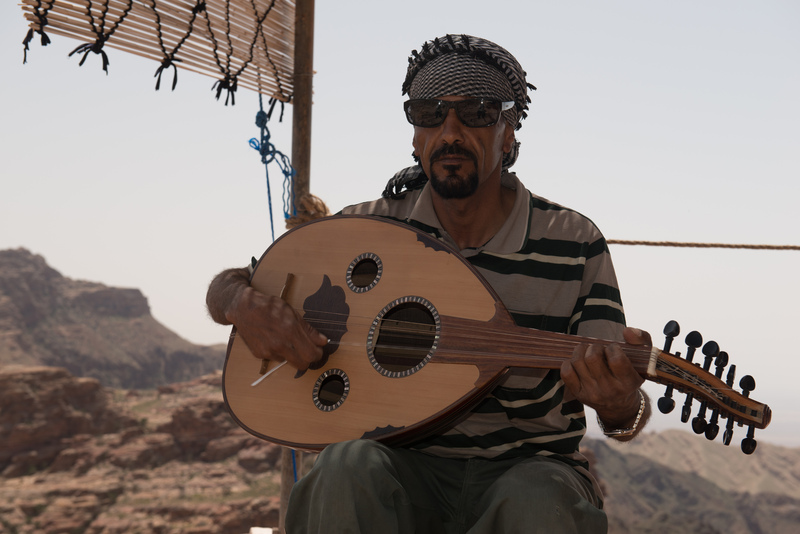 Once at the top, Fred climbed even higher to a lookout where a man was playing an oud. This view would inspire anyone to practice their scales! Denise remained gazing at the Monastery frontage and ate an apple, which was to be lunch for the day. We started back down and again stopped at our friendly vendor for a very gooey Kit Kat and more mint lemon drink . Then we started the descent, step after step after step (more than 800) and the descent alone took almost an hour. Fallen rock tunnel on the trail to the Monastery. We then visited the Grand Temple. 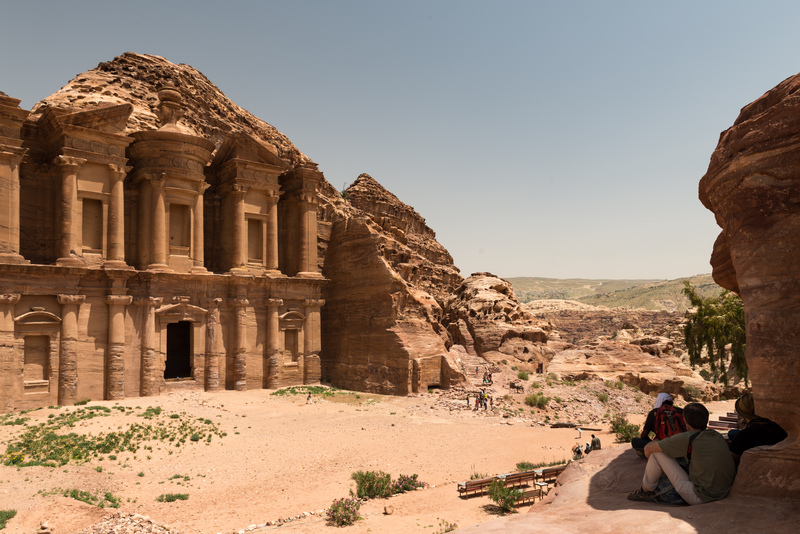 This temple is actually larger than the Temple of Artemis at Jerash, but at Petra, most of the attention is focussed on the rock carved structures. It is easy to forget, that back in the day, the free standing structures were even larger. Sadly, most were damaged or destroyed by an earthquake. 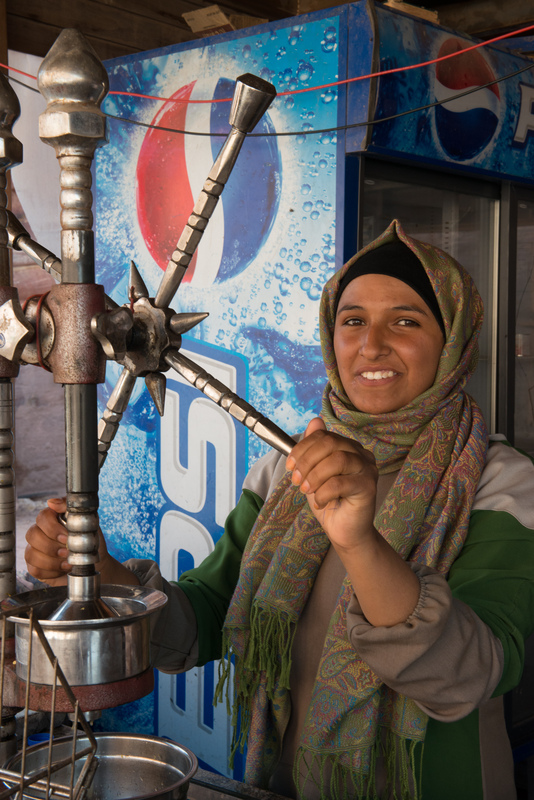 We continued down the Street of Facades in front of the tombs and found a vendor with shade and ice-cream. So we stopped for a mint and lemon drink and an ice-cream (you may be noting a pattern here!). We were tired and decided to return to the Treasury on camelback. It was a short ride, about 10 minutes, but it was something that Denise had wanted to do. However, Denise is delighted to say that having done it, she will not do it again as her back did not enjoy it as much as she did! Fred enjoyed it and was only sorry the ride was so short. Heading into the lower Siq. Then it was time for the hike back to the hotel. We made it back to the hotel by 6.00 pm, showered and staggered down to the buffet again. The Jordanian dish was different on this evening, but still excellent, and we were too tired to even walk to an outside restaurant. We were exceedingly glad that we had picked the Movenpick Hotel right at the gate to the ruins; ten hours, and 800 steps up, is a long day! This entry was posted in Other Travel on August 13, 2016 by DiploStrat. 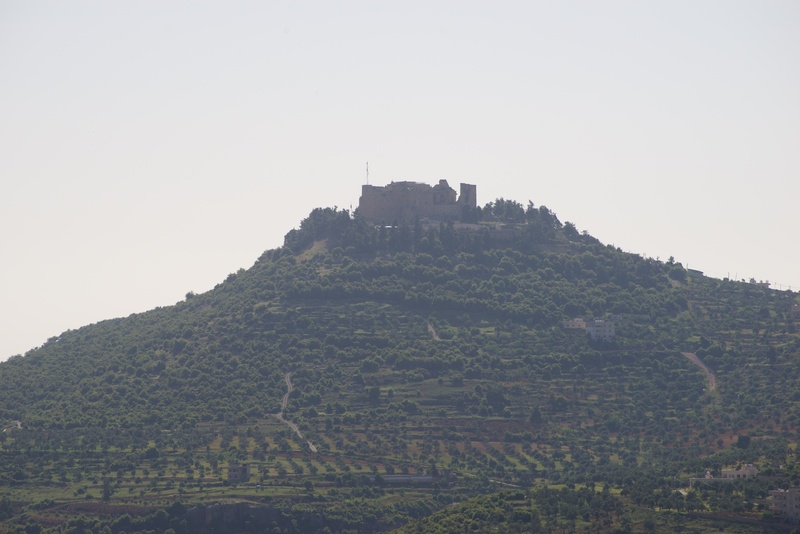 Off again after breakfast, which proved much better than dinner, we headed to Karak Castle, best known as the castle of the crusader Reynald de Châtillon. The scenery on the old “King’s Highway” was spectacular. 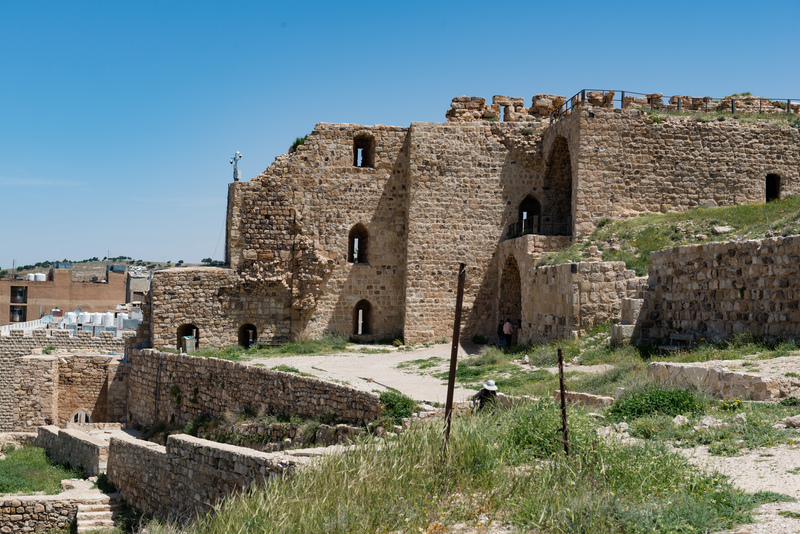 Kerak has been fortified since Biblical times but the castle that you can visit today was started in the 1140’s. 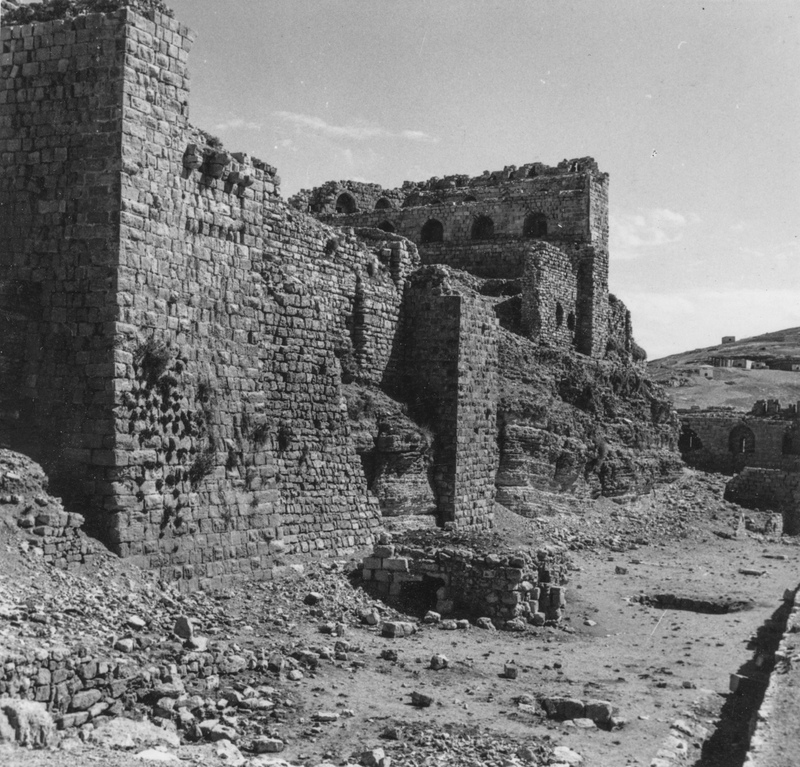 It took about twenty years to build the first castle and the castle was used by the Crusaders, the Umayyads and was still in use in Ottoman times. This has lead to many changes over the year, but the essential character of the castle remains. It is a “spur” castle, flanked by several enormous glacis and accessible only on the north side. The north wall is huge, more like a Keep than a wall or gate house and proceed by a deep fosse or moat. It is easy to see why the castle was able to withstand several sieges. The castle was interesting in that it was built on a cliff but was also built down into the cliff. 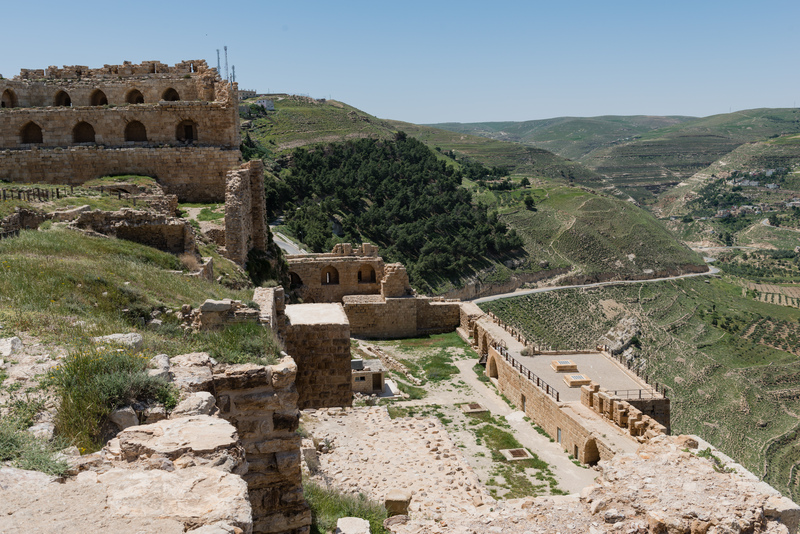 Between tunneling in the mountain and filling in the space between the walls, Kerak sometimes feels more like one big, multistory building, than a classic wall-around-the-inner-ward of other castles. 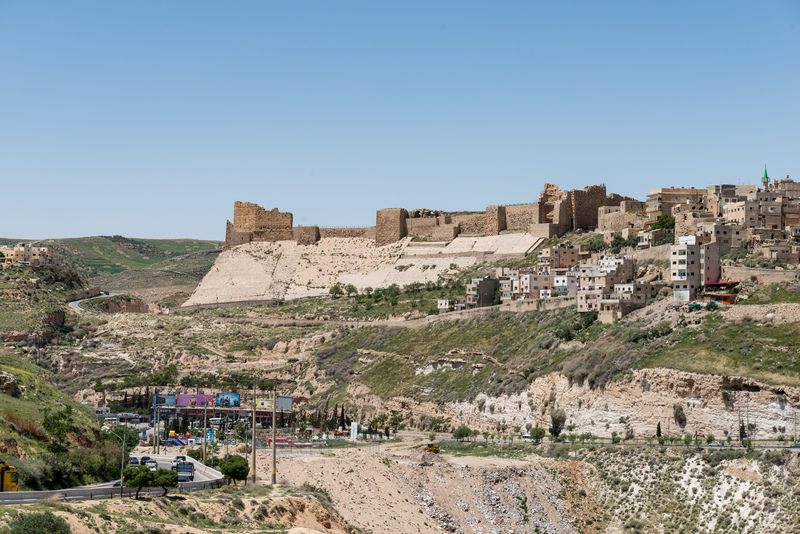 However you describe it, Kerak is is one of the big ten of castles in the world. 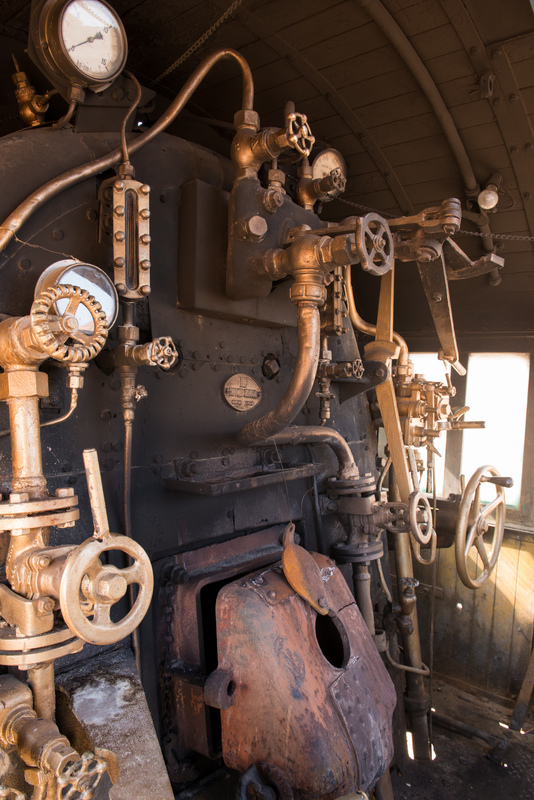 Turning on the way-back machine, Kerak was one of Fred’s favorite destinations as a child. 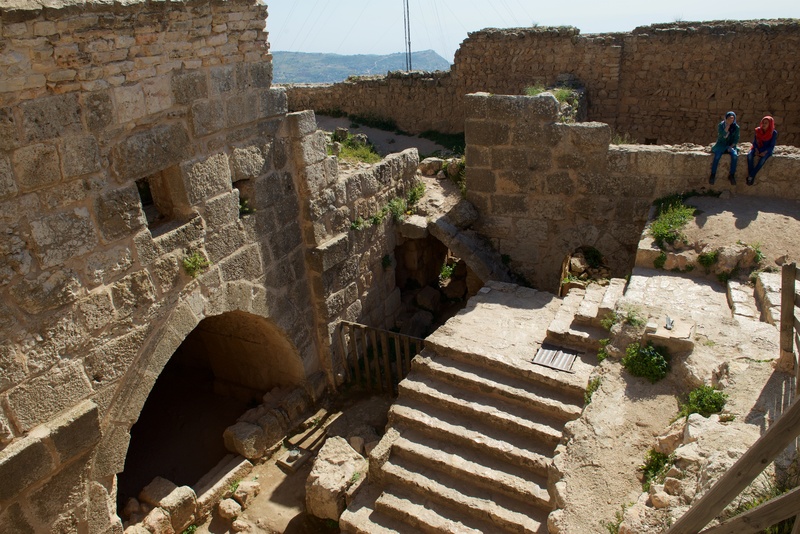 Kerak today is a well preserved archeological site. Back in the 1950’s it was a wonderful playground for kids. especially those obsessed with history. And cows. Kerak today has more visitors in a day than it would have had in a month. Photos were taken by Fred or, more likely as they are full frame, by his Father. (Fred had a half frame camera as a child.) From their size, they may have all been contact prints. Cow taking in the sights. 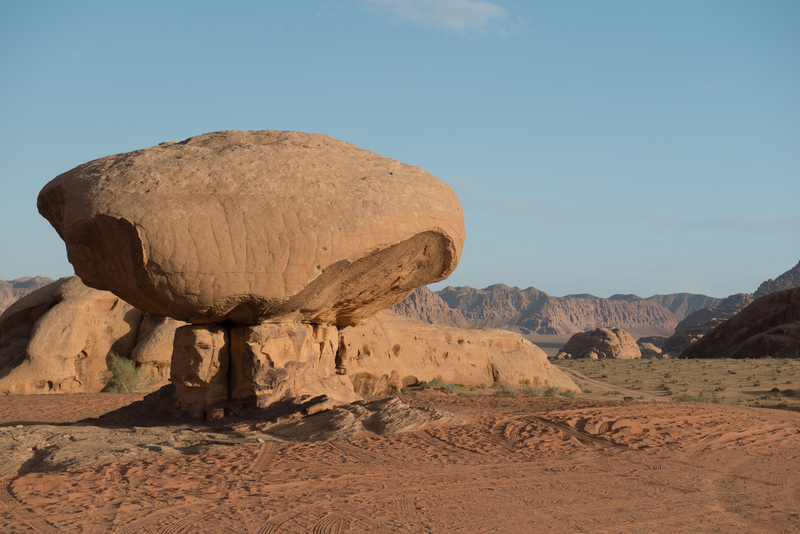 Part of Kerak’s strategic importance came from its location astride the Moab trade routes. 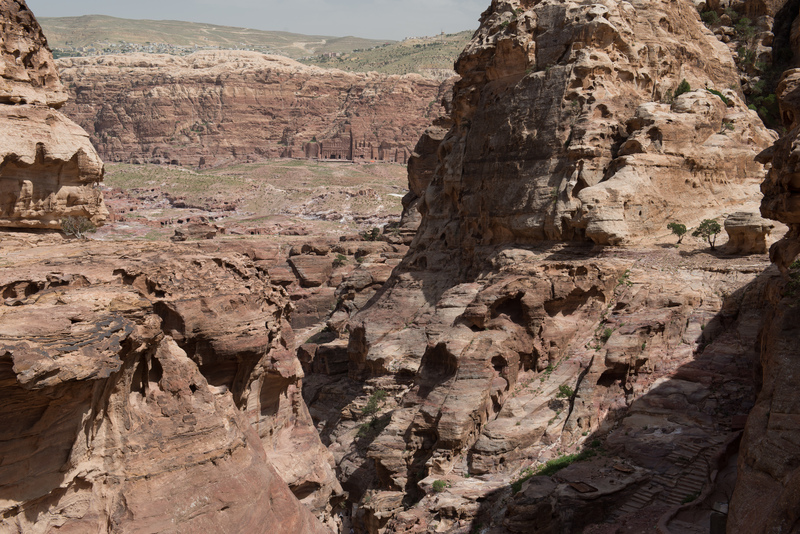 From its heights you can see all the way to the Dead Sea. We found ourselves acquired by a charming and authentic sounding guide, which given a total lack of any form of explanation (unlike Aljoun Castle which had been well documented), made our visit much more understandable. We would have been guessing at rooms otherwise. That said, all guides must be taken with at least some salt. As you can see from the map, there was a lot to see. 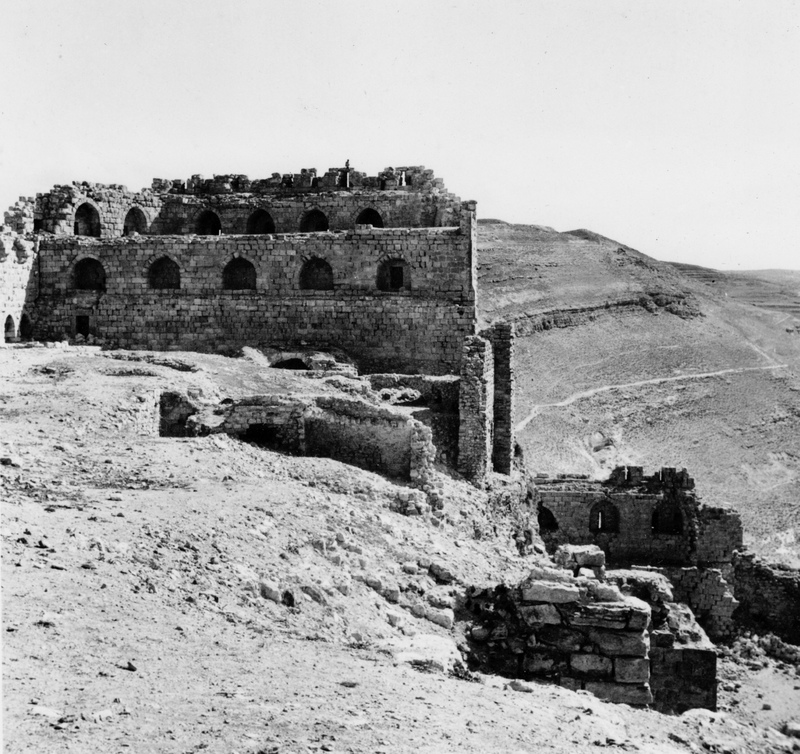 Worth noting that the castle was originally surrounded by Kerak town, of which little remains. 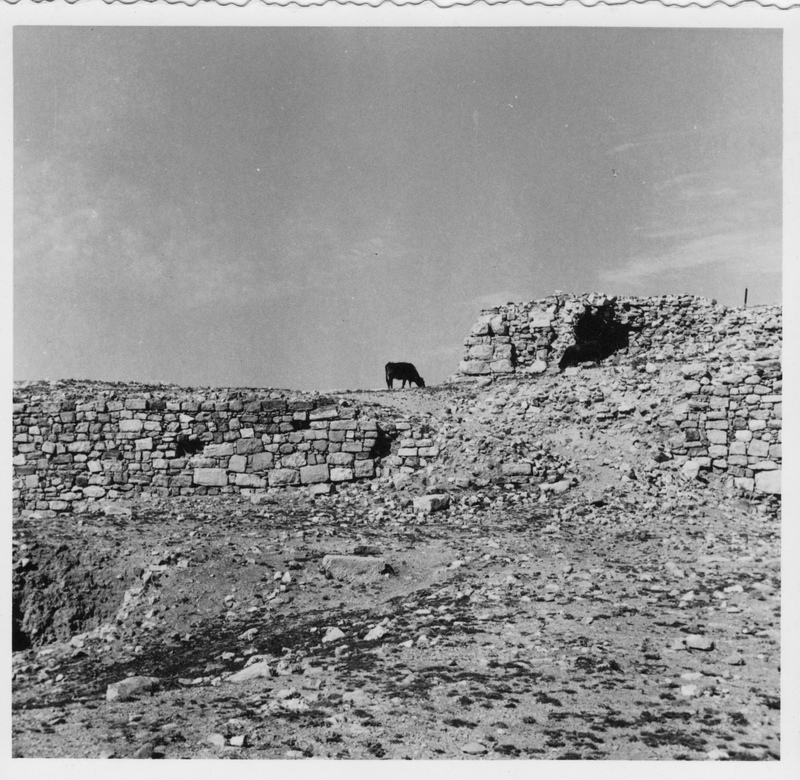 The town was sometimes taken and destroyed when the castle still held out. 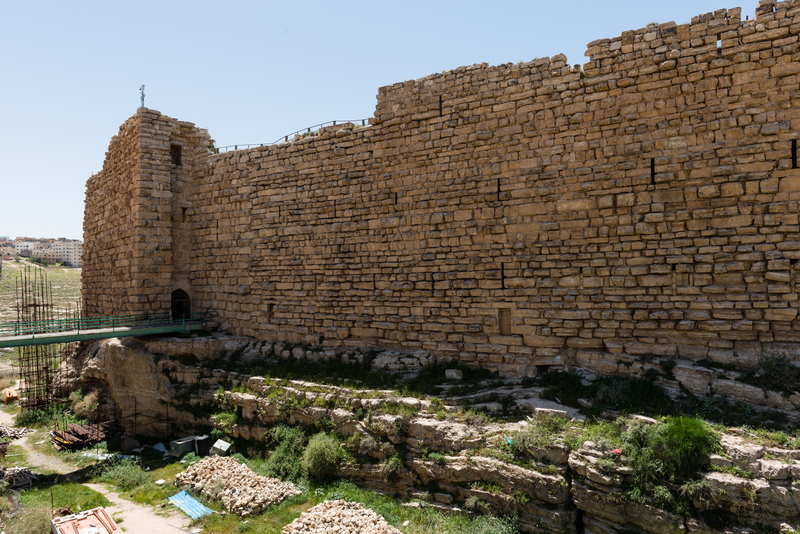 The modern Kerak remains a largely Christian community. We started at the north face. Over the centuries, the fosse has largely been filled in. There would have been wooden bridges over the fosse to the main and postern gates; wooden so that they could be easily destroyed when the castle was attacked. The little opening on the left was the Postern gate. You would first have to cross the fosse or moat, exposed to attack from the battlements and arrow loops. And, when you got there, there was no place to mount a ram. Once inside, we could look back at the massive North Wall. While most of the construction is of stone, there would have been lots wooden and mud brick walls and floors as well. From the Upper Court. Note the two huge galleries. The main gate was somewhere to the left in the image. The great North Wall was a warren of passages and rooms. Denise is next to a stair way. Further on is an arrow loop looking out of the North Wall. The Postern gate was tiny and only accessible from the side. There was almost no way to attack it with a ram or catapult projectiles. Steps from one huge gallery to another. Main level gallery. The main gate is down one of the passages to the left. The vaults are said to be stables for horses. Ahead of us was the inner ward, divided into Upper and Lower Courts. It has changed a bit over the years. Shows the southern keep and the upper and lower courts. We started out underground. 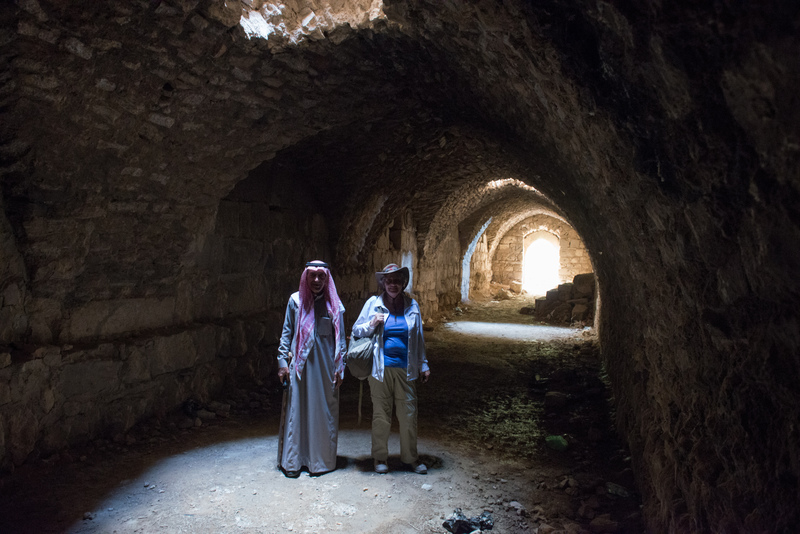 In Kerak, more than any other castle we have visited, the underground galleries are simply amazing. We saw the multiple levels of cells (some with fireplaces for the better class of prisoner!) and huge stables. One of several small rooms, said to be prison cells for upper class hostages, complete with fireplace below the window. Water is essential for withstanding a siege which might last years, especially in arid country. There are accounts of sieges being lifted when the attackers ran out of water before the castle. This is one of many huge cisterns in and around the castle. At least four distinct levels here. Note the thickness of the walls. The Southern Keep, seen from the Lower Court. Been taking this photo for a long time! We had a special guide who knew all about the underground passages. Looking down at the Lower Court on the western side of the castle. North corner of the Lower Court. The Lower Court, looking northwest. The Museum is there today. There are great views over the modern town as well. Don’t know the date of the glacis, but imagine trying to fight your way up that slope. View of towers, the glacis, and the modern town to the north. As noted, many of the “surface” ruins are still a long way underground. There is a lot more excavation to do. Maybe there will be more to see if we make it back again! 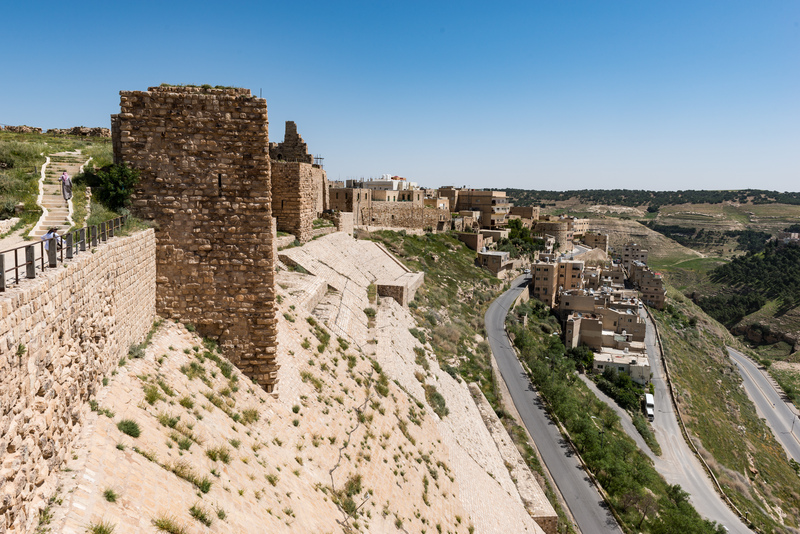 Kerak belongs on every history nut’s bucket list. This entry was posted in Other Travel on August 8, 2016 by DiploStrat. Fred remembers staying at the Dead Sea Hotel as a child. 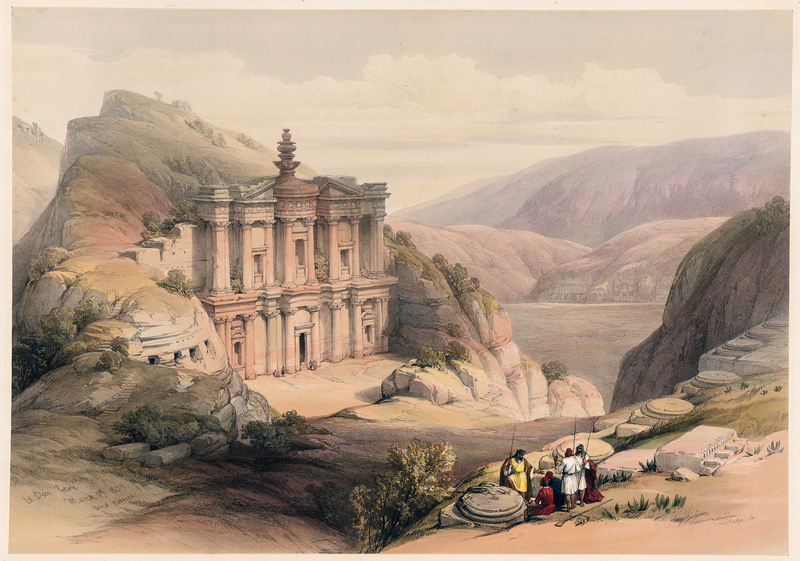 It was right at the mouth of the River Jordan, just a few miles from the main Amman to Jerusalem road. The hotel is long gone now, but it was quite lovely. The Dead Sea is famous, of course, as the lowest point of dry land on earth, at about 1300 feet below sea level. The used to be a sign on the road to Jerusalem to let you know when you had climbed back up to sea level. Like the Great Salt Lake in the United States, it is very salty, so salty that it is almost impossible to swim underwater. 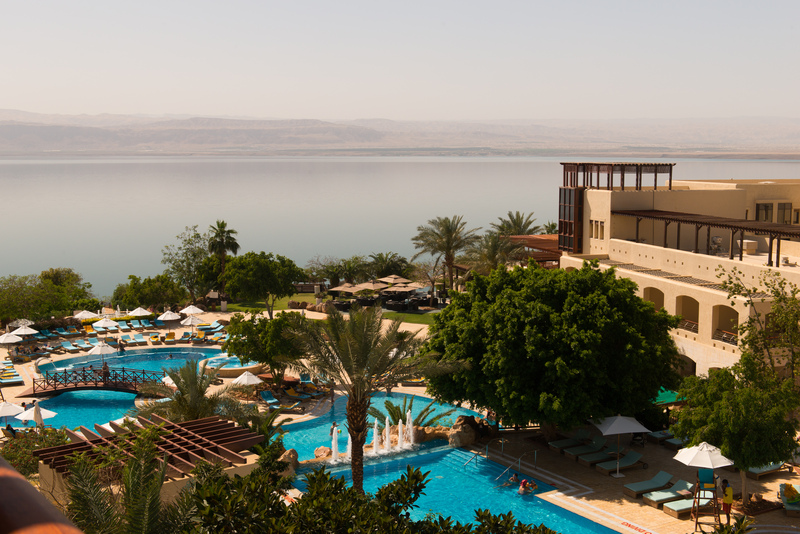 We checked into our hotel and decided that we must do the needful and swim in the Dead Sea. So we changed into swim garb and headed out. With the loss of the West Bank to Israel, all of the hotels are in a huge tourist complex on the east bank of the sad and a hit higher up the slopes. The level of the sea has dropped so much that it is actually quite hard to get to the water. We walked for about 20 minutes down to the “beach” which turned out to be rocky and very hard to walk on. But we made it into the water, flopped around a bit, and then emerged. “Been there, done that”!! It is indeed salty, so salty that you cannot sink and it really stings if it gets onto your face! We rinsed off, walked our 20 minutes back to the hotel and Denise enjoyed a swim in the lovely warm pool. Grumbling that “it wasn’t like that in the old days!” Fred went off to enjoy a massage in the spa. The Marriot Resort at the Dead Sea. 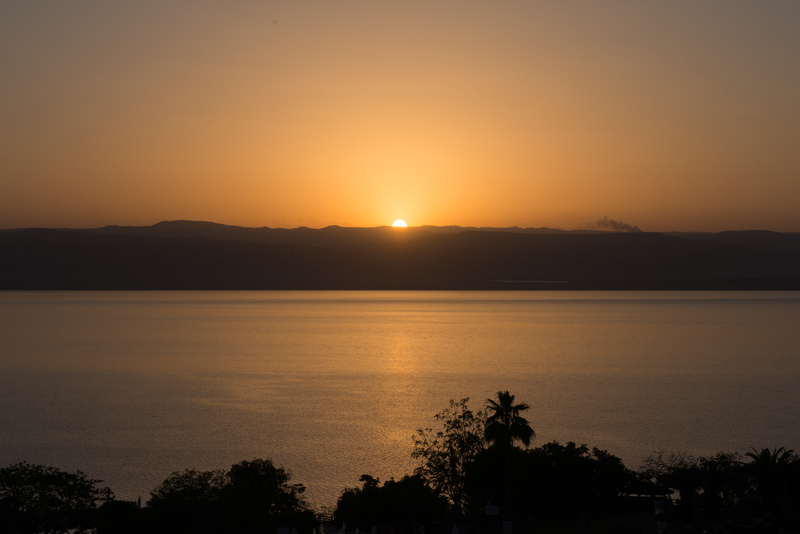 We watched the sun set over the West Bank and the lights of Jerusalem start to show on the ridgeline and headed for dinner. Fred was amazed, Jerusalem simply wasn’t that large back in the day. Sunset over the West Bank. We then went to watch the belly dancer perform while we enjoyed Turkish coffee and even stayed for her second show before calling it a night! Fred’s mother could never watch scenes of “belly dancing” in Hollywood films. She was an enthusiastic ballroom dancer and one night, in Beirut, she and a friend, also an excellent dancer were watching a dance performance. When the set ended, the friend asked the dancer to show her some of the moves. The dancer laughed and said, “Oh Madame, for you it is too late; I stared learning when I was five years old.” So although Rita Hayworth and others are indeed lovely, their Salome initiations look very awkward when you have seen the real thing. It was pleasantly warm and it was fun to people watch. 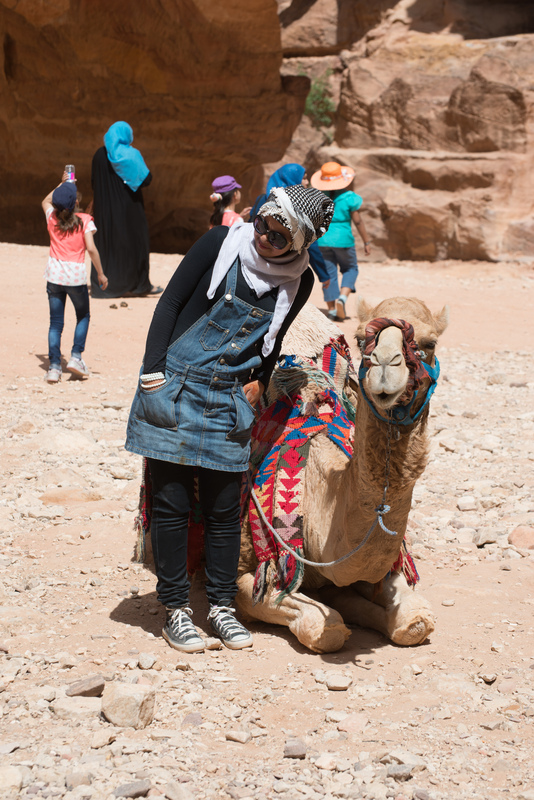 Everyone from tourists in shorts to ladies in abayats – Jordan is a wonderful country. Off again the next morning, we made a last minute decision to go to the Jordan River Baptismal Site, a visit that proved fascinating and far more interesting than Fred had anticipated. Fred was in curmudgeon mode, grumbling that he had already been to the river on a picnic and one of his friends had “baptized” himself by falling in. (His mother had not been pleased.) We drove to a central ticket office/car park where we waited for a bus and guide. The Jordan River is the border between Jordan and Israel and security is very tight and thus the various sites can only be visited in a group. 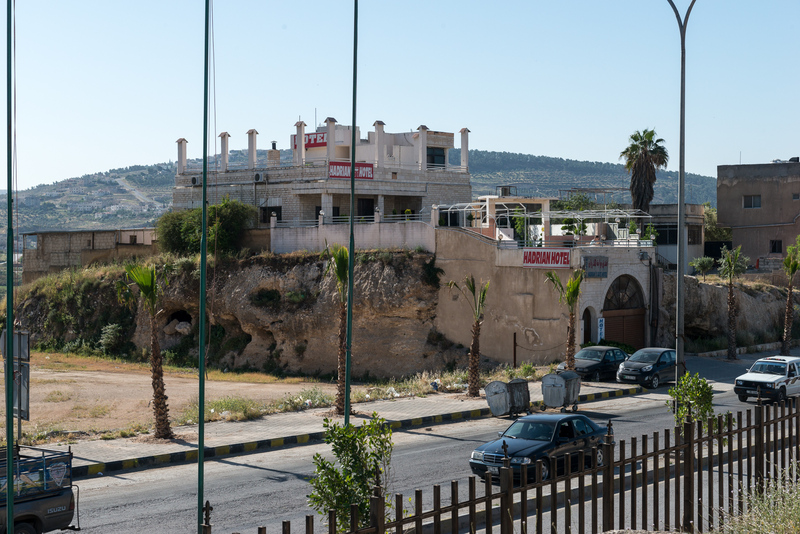 After a short wait, our bus arrived and off we went, passing first by the site of Elijah’s ascension, before other sites connected to John the Baptist. 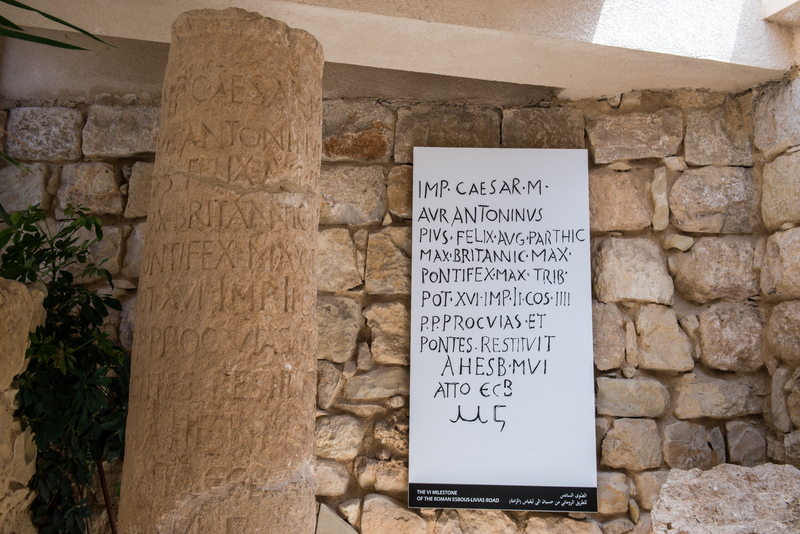 As noted on the site linked above, you could spend a long time visiting all the sites in the local area, many of which provide an interesting insight into the nature of early Christians. 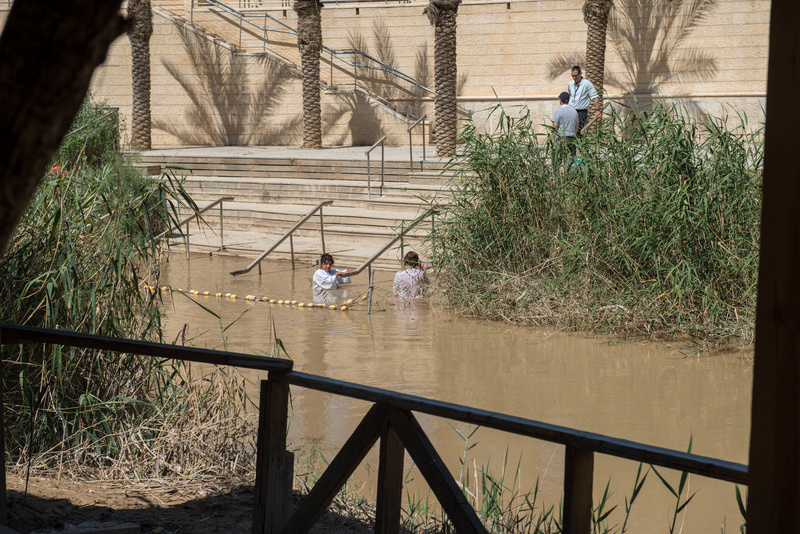 The Jordan River is much reduced in size since the 1950’s in part due to water being removed from it by Israel. 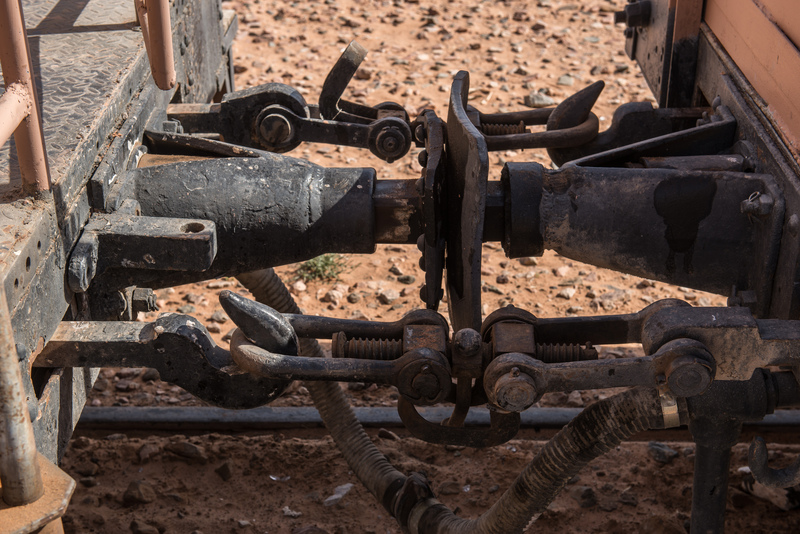 (Israel’s “miracle in the desert” comes with a price, much like our depletion of western aquifers.) The river has always been muddy and most historians have established by reading travelers’ accounts and through archeological digs that the true baptismal site is probably about 60 meters from the present river, at the site of a spring which used to drain into the river. 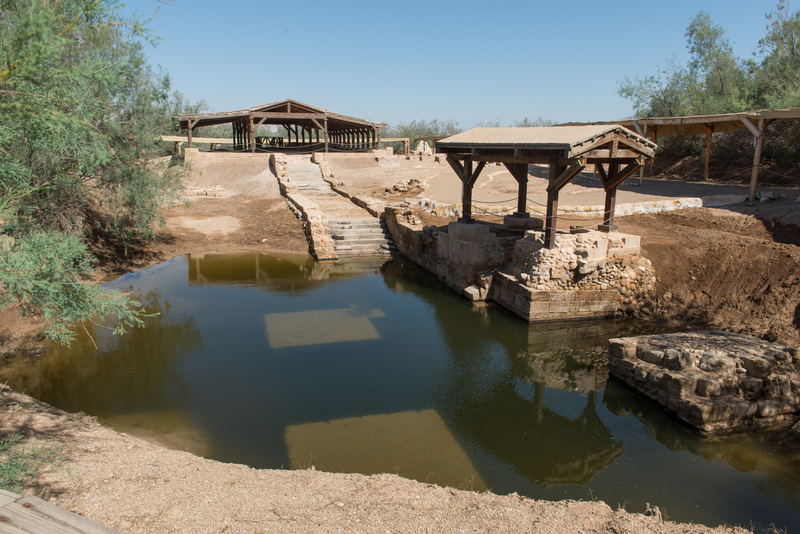 There are ruins of the various churches which were built over the spring at different times and it is very possible that this clean spring water was used for baptisms, rather than the always muddy Jordan. Ruins of Byzantine Church constructed over the spring where it is believed that John baptized Jesus. The large objects are the foundation pillars. As was the Byzantine custom, the church often completely enclosed the site. 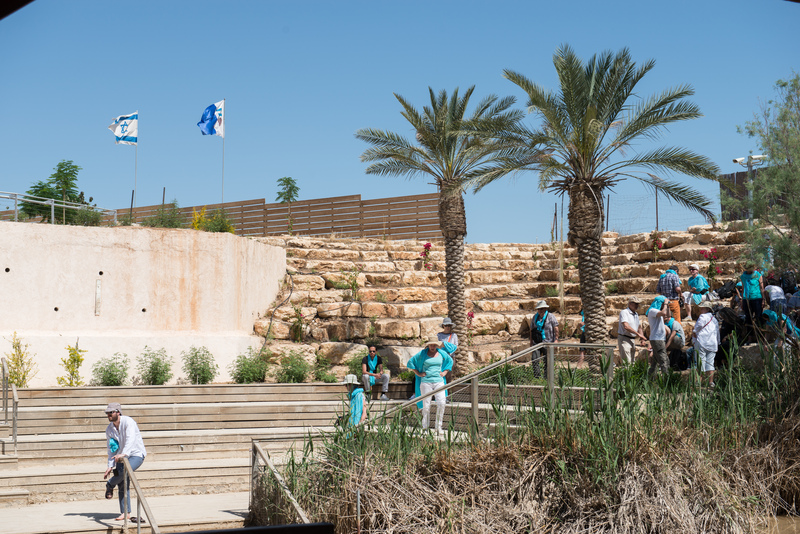 The Jordan River site on the Israel side has been highly developed for tourists and we watched various visitors immersing themselves in the muddy and unsavory looking water. We then headed out to Mt. Nebo, where there is an old church called the Moses Shrine, which is reputedly where Moses saw the Promised Land before he died. The church was unfortunately closed but we did see an old mosaic from the church and, of course, a huge selection of schoolgirls! 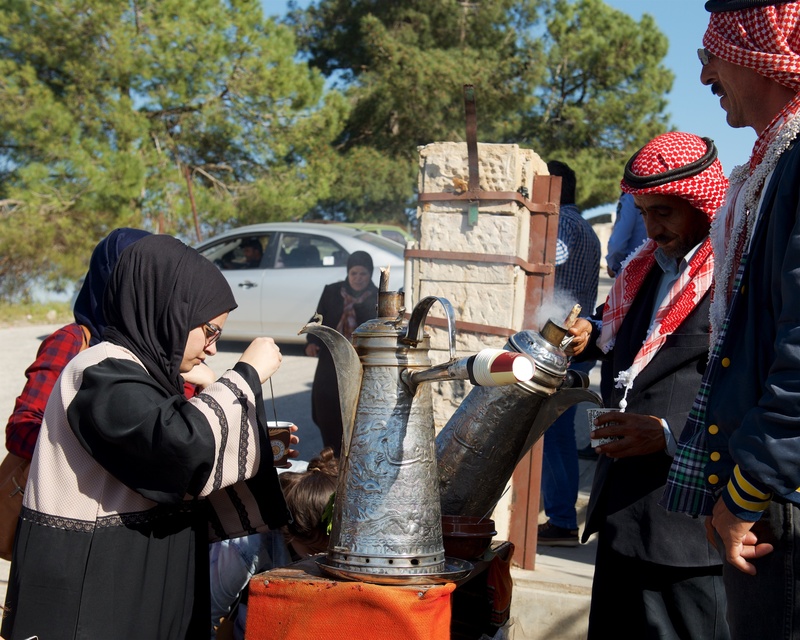 As a historical note, it is worth noting that one cannot see the land “flowing with milk and honey” from Mount Nebo, only the parched Jordan Valley. 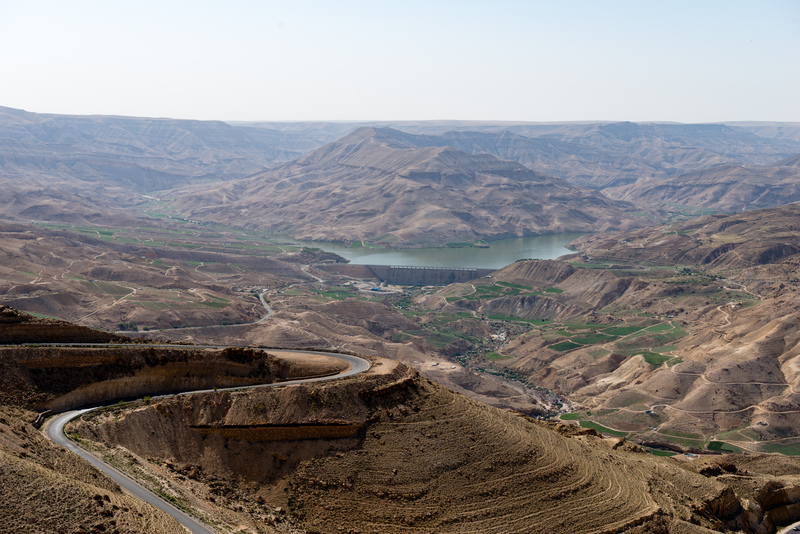 There has long been agriculture around Jericho, but the rest of the landscape, as you can see, is rather bleak. 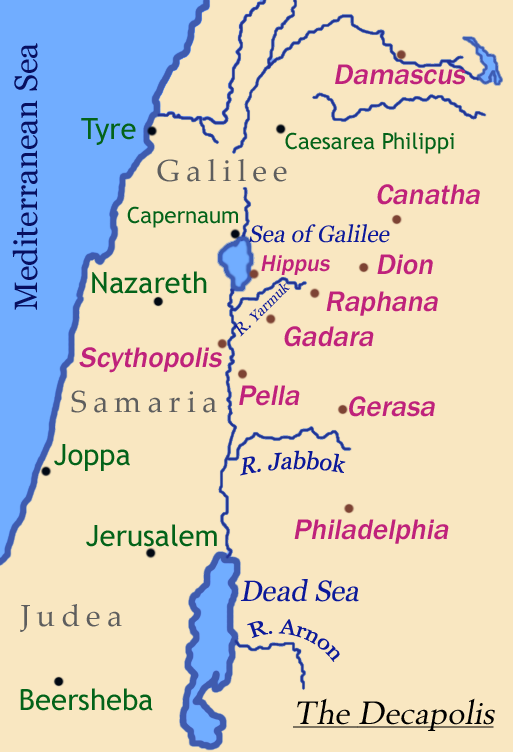 The fertile lands lie far beyond, between the Mediterranean and the hills were Jerusalem is located. It is possible that Moses stopped here because the people of Jericho blocked passage. 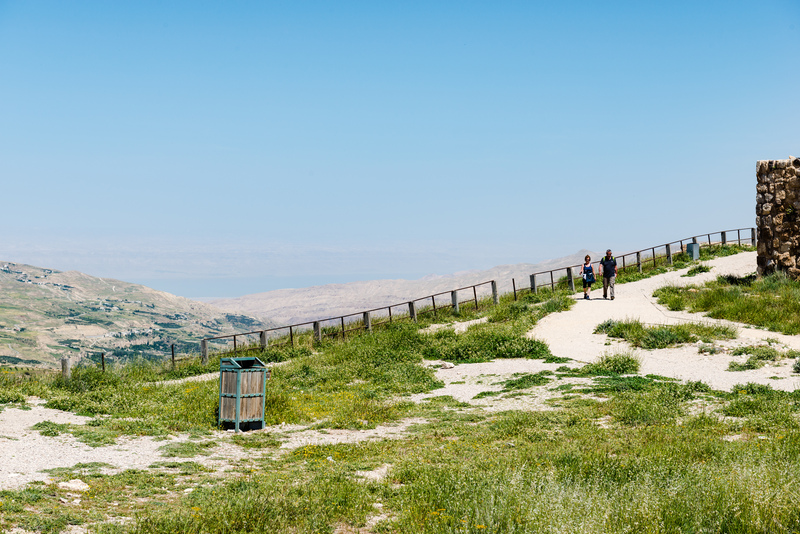 Whatever the truth, Mount Nebo has long been a site of pilgrimage, traditionally along the old Roman road from Jerusalem. 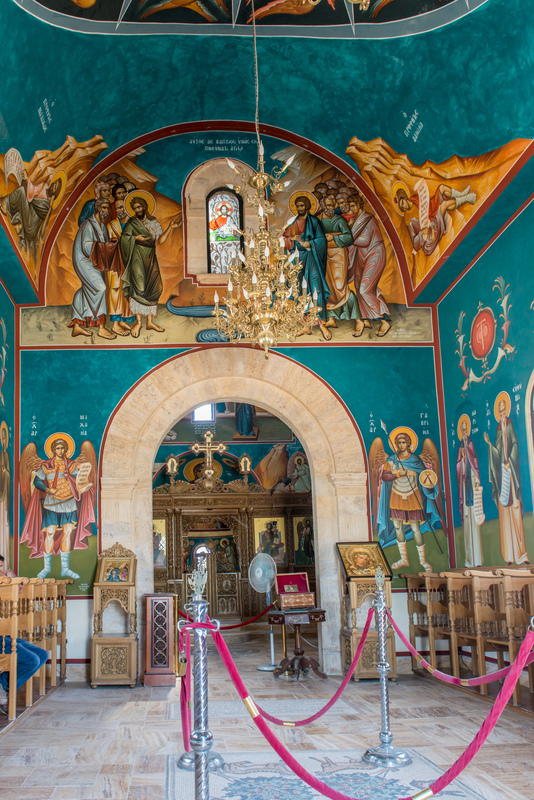 On to Madaba, where we stopped first at St. George’s Church to see the famous mosaic map of the Holy Land, crafted in AD 560, it is the oldest map of the region and gives many insights into the region, including, as noted, the location of the Baptismal site. Jerusalem is shown, as is the Dead Sea with the fishes swimming away from the salt. There is also a small museum at the Visitor Center which we enjoyed. 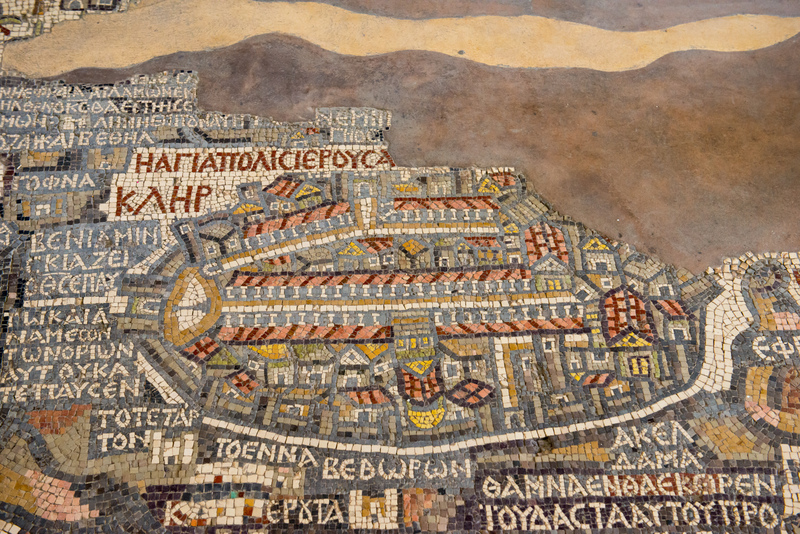 Close up of the medieval city of Jerusalem, showing the Cardo down the middle and the Church of the Holy Sepulcher in the foreground. The map was on the floor and suffered as the church has been in daily use for a thousand years. After a quick lunch, we headed to our hotel which proved to be in a residential neighborhood and quite nice. We took a much needed nap and then headed down to the pool for coffee and a nice chat with the Hotel Manager as the sun set. Dinner was somewhat of a disappointment but we had not noticed any obvious restaurants in walking distance, so decided to stay put. We should have been more adventuresome! This entry was posted in Other Travel on August 5, 2016 by DiploStrat. 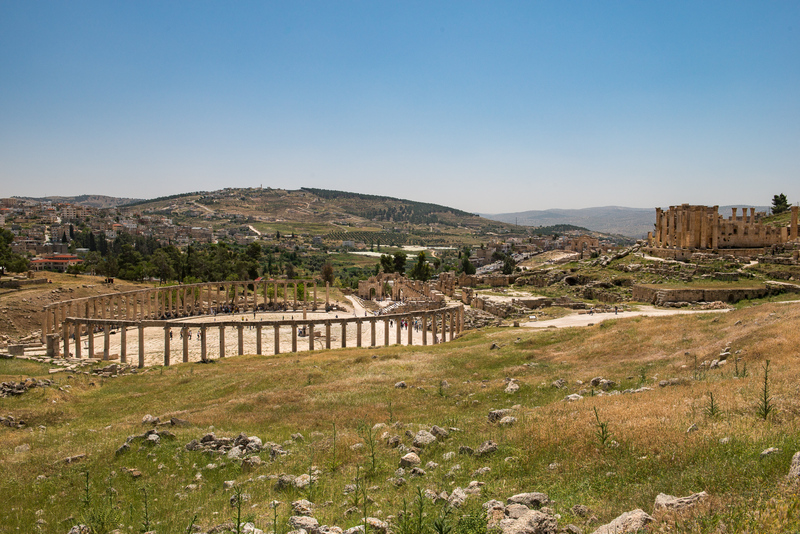 And finally on to another Decapolis city, Jerash. 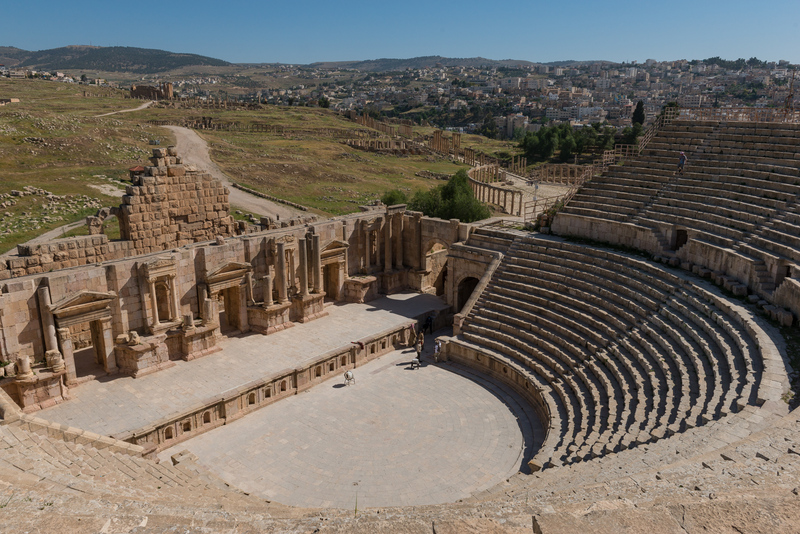 (https://en.wikipedia.org/wiki/Jerash) It can be argued that if you can only visit one Roman site in your lifetime, it should be Jerash. 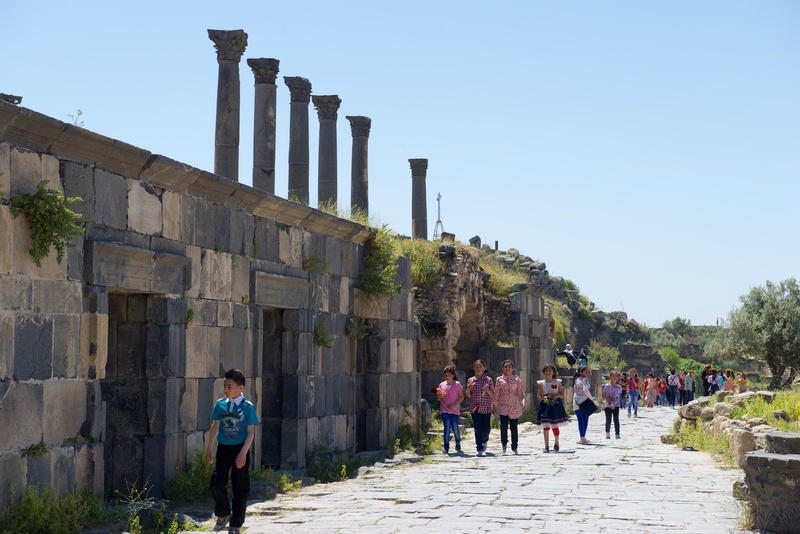 As the city was rarely attacked (most of its life it did not even have walls) and because it was abandoned after an earthquake, there are few other sites in the world where the original layout of a Roman city, with its Cardo and crossing streets is so easy to see. 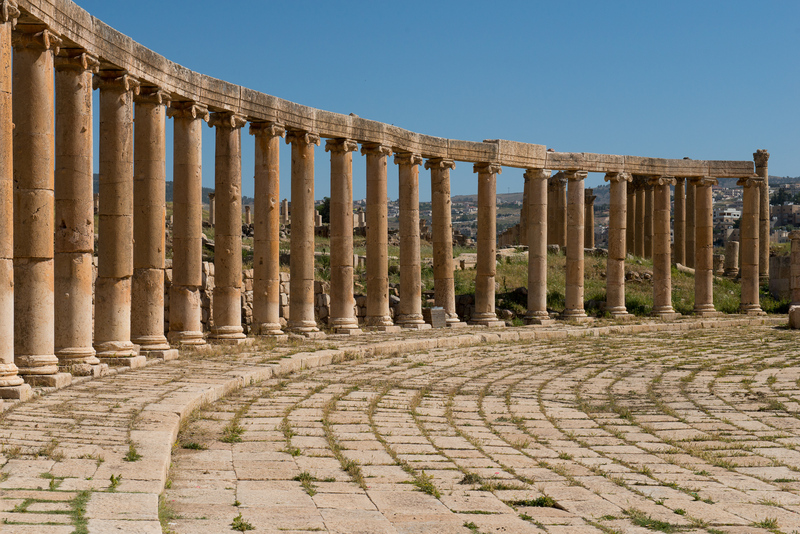 Fred remembers picnics at Jerash as being particularly wonderful. The Hadrian’s Gate hotel, literally across the street from the entrance to the ruins. Fred took a quick photographic tour of the street before we stepped out for Jordanian fast food for dinner. Hadrian’s Gate, not really a gate, but an arch built to honor the visit of the Emperor Hadrian. Unidentified ruins still standing in the modern city. Roman? Umayadd? We started our visit to Jordan in Philadelphia (Amman) and then went to Gadara (Um Qais) and now we are at Gerasa (Jerash). We were up and about early and into the ruins via Hadrian’s Gate by 8.30 AM. We entered at Hadrian’s Gate on the left of the map. 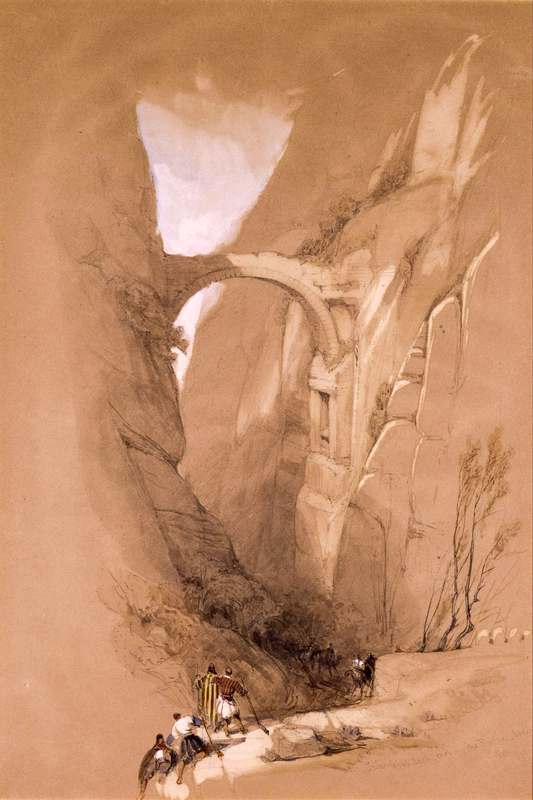 Note that the arch was well outside of the walls, which were not, in fact, built until late in the life of the city. Our guidebook had warned that a visit needed 3 to 4 hours to do it justice and indeed, we spent about 4 hours there and saw most of it, including the sheep and goats grazing amongst the ruins. We saw the hippodrome (and imagined the chariot races), the Forum, the Agora, the Cardo Maximus or colonnaded main thoroughfare, temples to Zeus and Artemis, the Nymphaeum (public water fountain), multiple theaters and several churches (dating from the Christian times, often using stones from the aforementioned temples in their construction). Each crossroad had its tetrapylon (archway with four entrances) which solved the problem of roads not quite lining up! Fans of Ben-Hur will be impressed. This is the real thing. The South Theatre is stunning. South Theatre, looking towards the Temple of Artemis. Forum to the right with the modern city behind. Fallen columns at the Temple of Zeus. They are big! 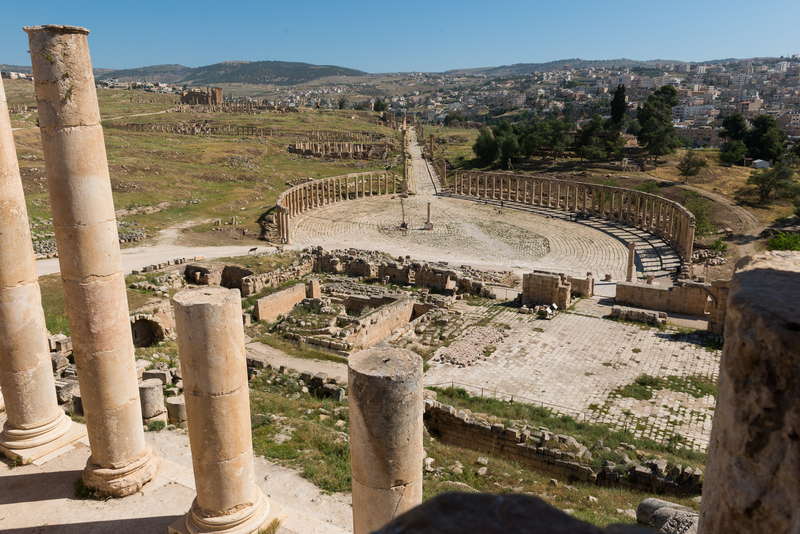 Perhaps the most iconic shot of Jerash is the oval Forum. View from the Temple of Zeus, looking north down the Cardo. 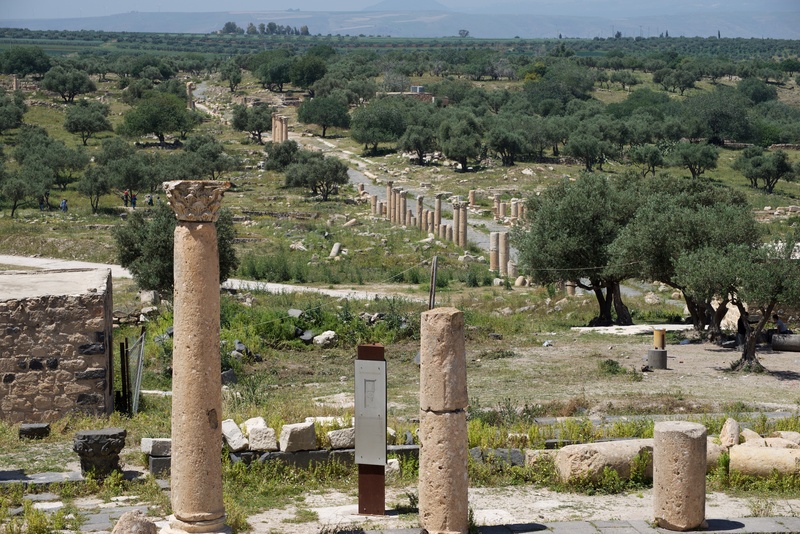 The Temple of Artemis is to the left on the slope. Note the vast expanses still to be excavated. 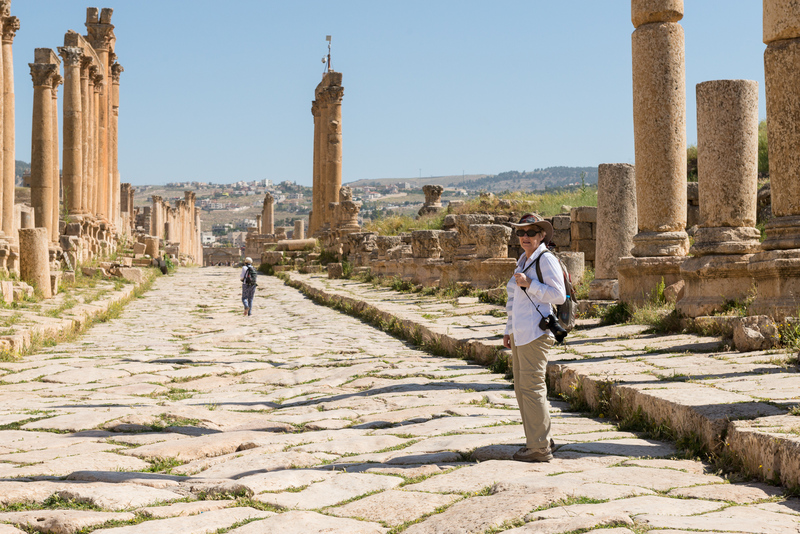 Walking the streets it is easy to imagine life in Jerash in about 150AD. Denise on Jerash’s Rodeo Drive. North end of town, showing tetraplyon, columns, and the modern city across the river. Manhole giving access to the coloca or sewer. 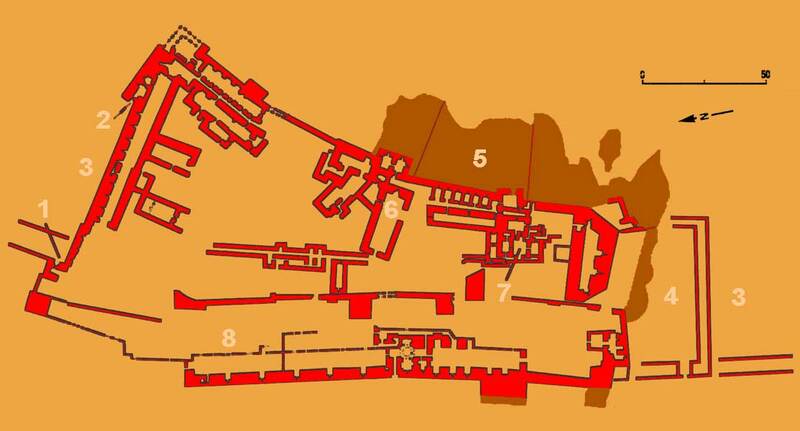 The Romans ran sewers under all of the main streets. This manhole cover still has its original iron ring. Colonnaded street. You have to imagine that the space behind these columns was filled with stores and houses. Fred photographing under a tetrapylon. Modern bridge to the new city near the baths and site of the old bridge. An unexcavated side street, looking towards the Cardo. 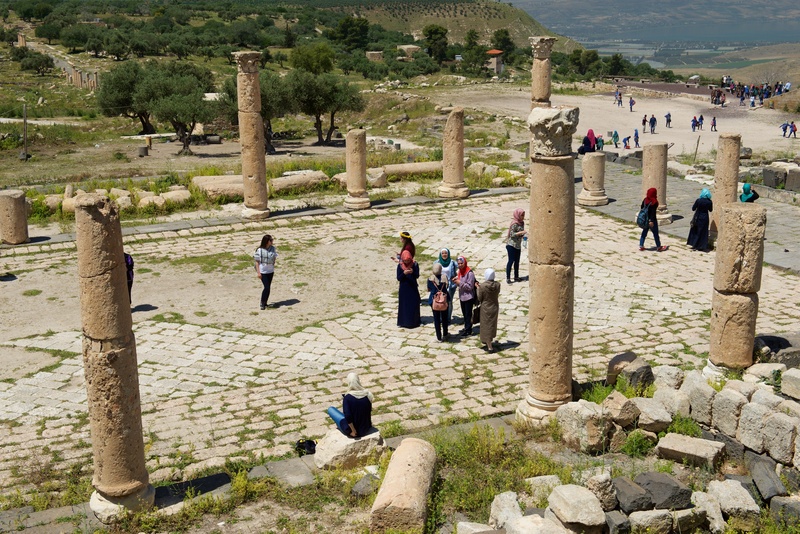 The Temple of Artemis is one of the main attractions of Jerash. Artemis was the patron goddess of the city. Temple of Artemis, square on. The central colonnaded building is only a tiny part of what was a huge temple complex. The Crusaders later used it as a fort. The Temple of Artemis as it appeared when Fred visited as a child. Notice that none of the surrounding space had been excavated. View out of the catacombs under the Temple of Artemis. Fred LOVES underground passages! Reconstruction of Roman water driven sawmill. A lot more technology than you would expect. By the time we reached the top, near the church of St. Peter and St. Paul, we could look back over the ruins and noting the arrival of bus loads of kids, we decided to call it a day. Looking over the ruins towards the modern city on the left. 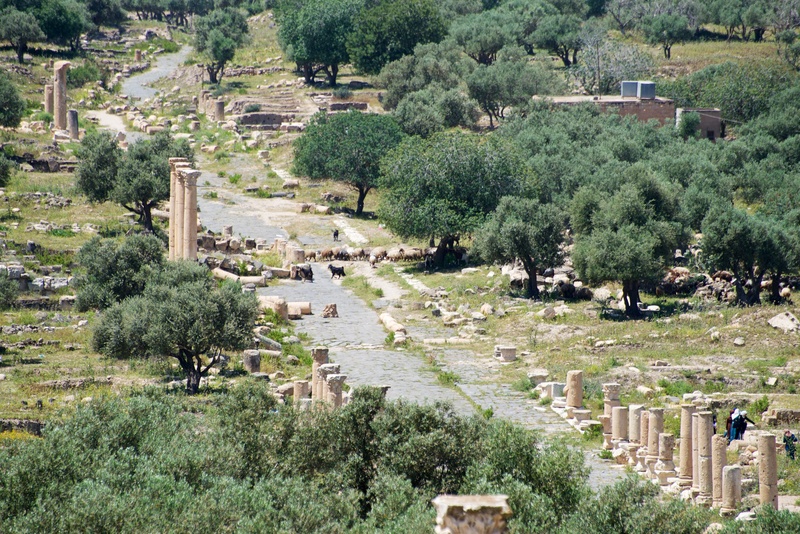 Temple of Zeus on the right. Notice all of the unexcavated land. After morning in the ruins, we returned to the hotel and Fred went out to get a take away lunch. 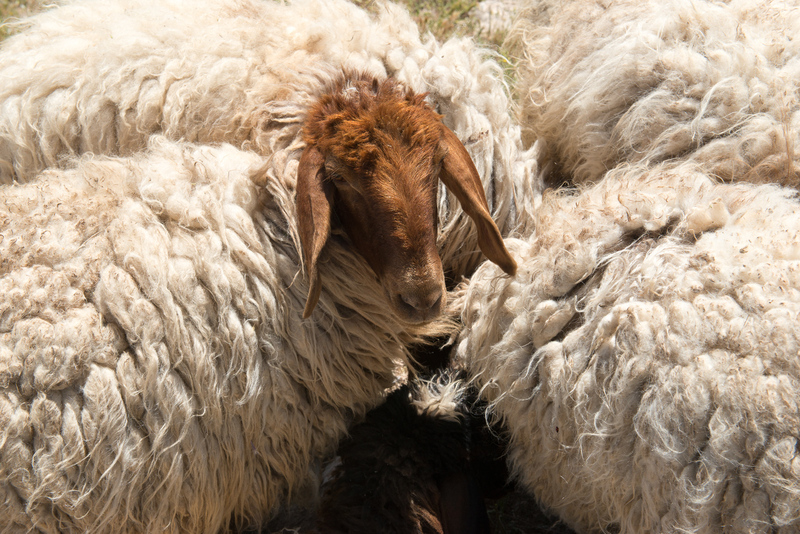 After a lemon mint drink to revive us and a half a sandwich each, we loaded up our luggage from the hotel into our car and headed south to the Dead Sea, saying “Good bye” to the historic sheep of Jerash. This entry was posted in Other Travel on August 2, 2016 by DiploStrat. 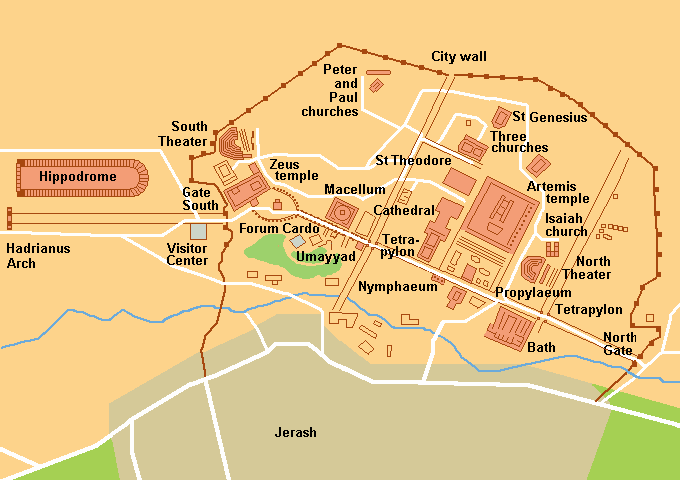 The Cardo was the main street of a Roman city. 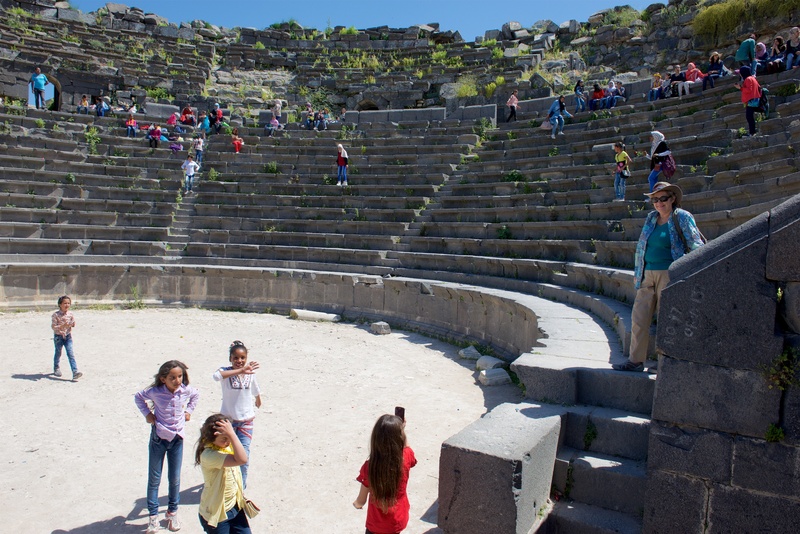 We hired a guide and from him learned a lot about the theatre (and how to find the perfect spot for a voice to carry) and a group of rectangular ruins along the Roman road, which were clearly shops. Much of the city is constructed of black volcanic stone. A row of shops in Gadara. Denise in the tunnel to the stage of a theatre in Gadara. What else do you do when you get on stage? 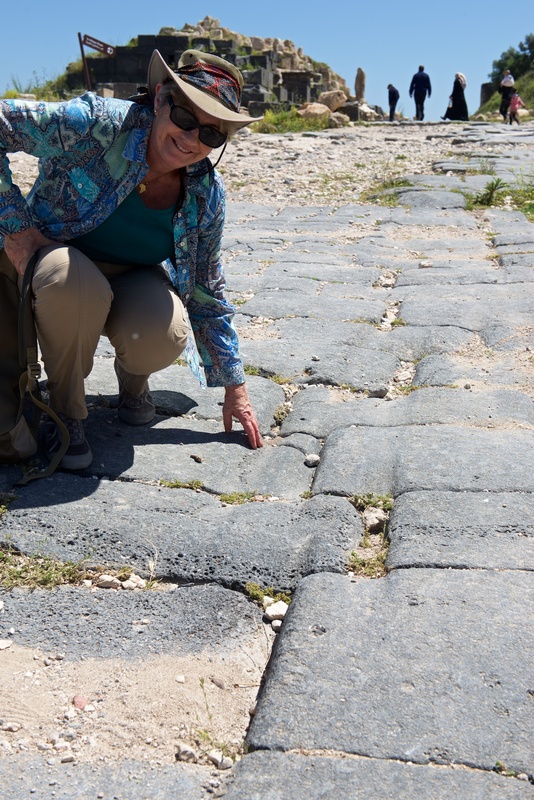 We also learned that blocks were placed diagonally on the roads so that the chariots were quieter but pedestrian crossings had squared blocks placed for ease of crossing. There is a complete Roman town to be discovered here with temples, baths and other buildings common to Roman life. In fact, excavations were being undertaken at the far end of the Roman road on two storey shops and homes. You can see how much is left to excavate. Note the diagonal paving stones. The diagonal paving made less noise with wagon wheels. Roman water tunnels ran under the city of Gadara and for hundreds of kilometers, bringing down water from springs and the mountains. The detail and craftsmanship is amazing; you would think it was modeling clay, not marble. Note the beautiful work where the stone is cut out completely. Years ago, in Arequipa, Peru, we thought that it was wonderful when Peruvians and not just foreign tourists visited historic and other sites. 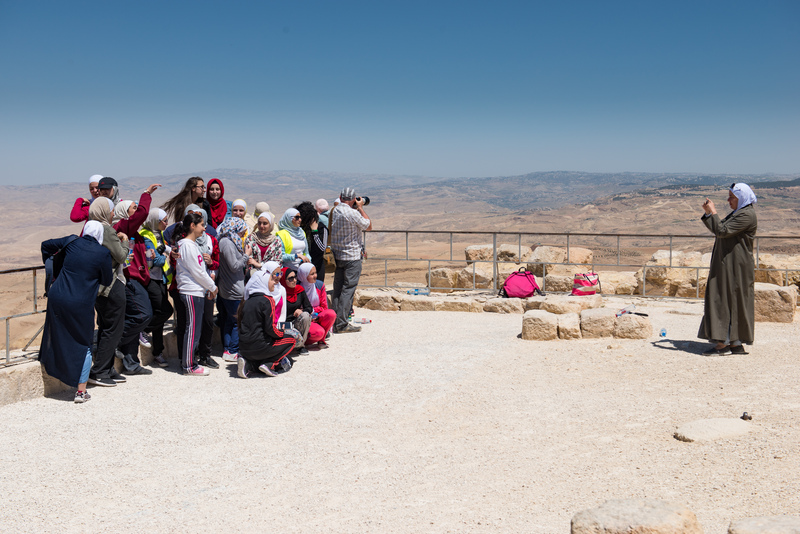 Again in Um Qais we were delighted to see how many Jordanians were touring the site. Roman building elements reused for a church. And, as always, Denise quickly attracted an entourage. From the lookout point at Umm Quais, the view was stupendous. We saw Mount Hermon, the Sea of Galilee, the Golan Heights (now Israel), and Syria, in the distance. We even heard the distant sound of artillery fire or bombing, which brought home to us the reality of the conflicts in that part of the Middle East. 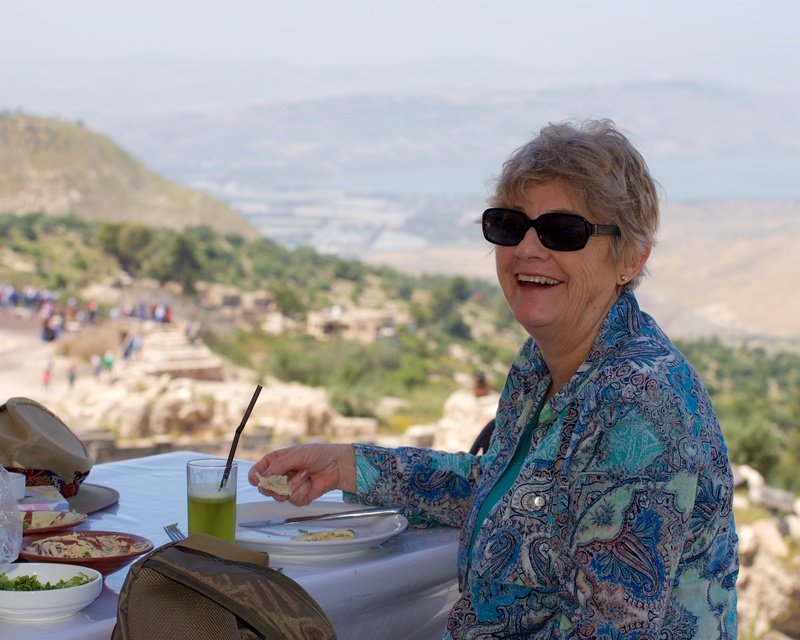 We enjoyed a lovely lunch at the Rest House, gazing over the Sea of Galilee and down into Israel at the foot of the valley. Bridge on the Haifa branch of the Hijaz Railway. 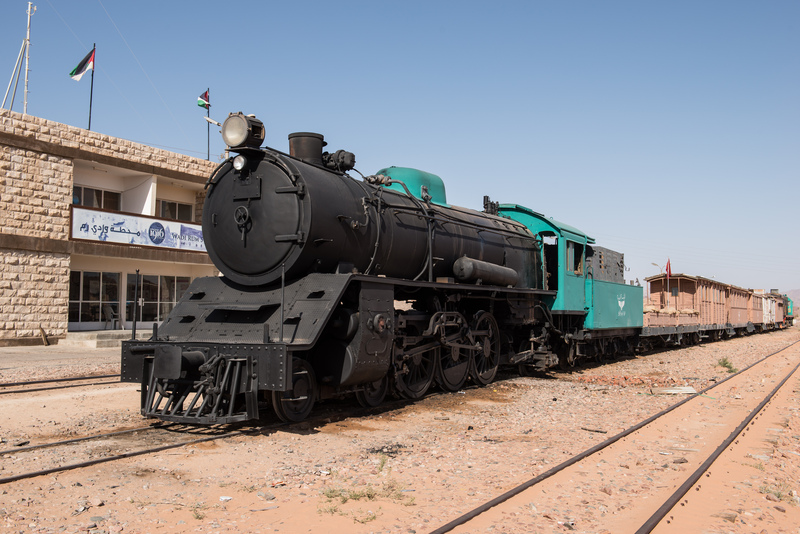 The rail line was cut by the Israelis during the 1948 fighting. Never rebuilt, it is now cut by the border, the silver fence splitting the picture. Israel is to the left. 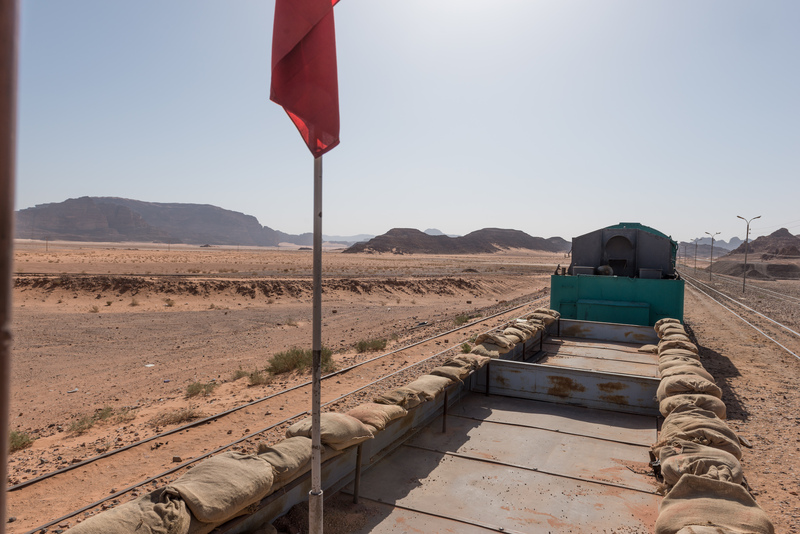 Unused Jordanian army bunker facing Israel. It was never taken by the Crusaders and the full range of fortifications, from moat to murder gaps (not just holes), trebuchet balls, and extra towers can be clearly seen. Imagine being on the receiving end of these. As always, a medieval castle has a view. The castle was later damaged by the Mongols and restored. And, after a hard day to touring, a cup of coffee. This entry was posted in Other Travel on July 27, 2016 by DiploStrat.